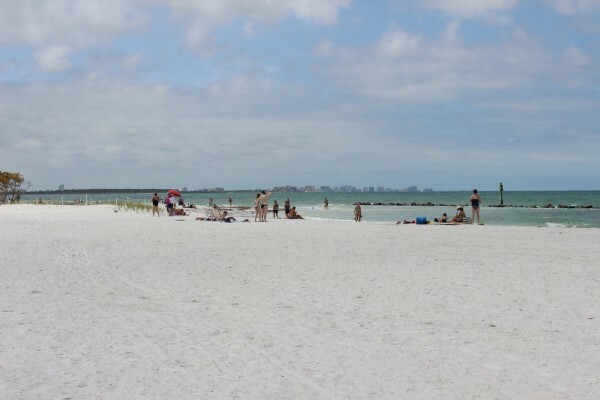 We have gathered insights on the best beaches and parks in the area. 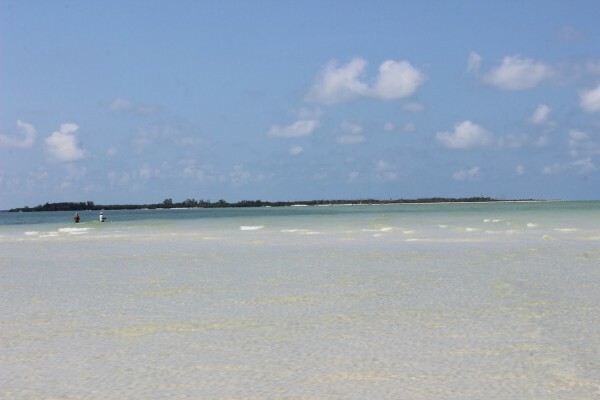 Places to unwind or just relax in this wonderful paradise. 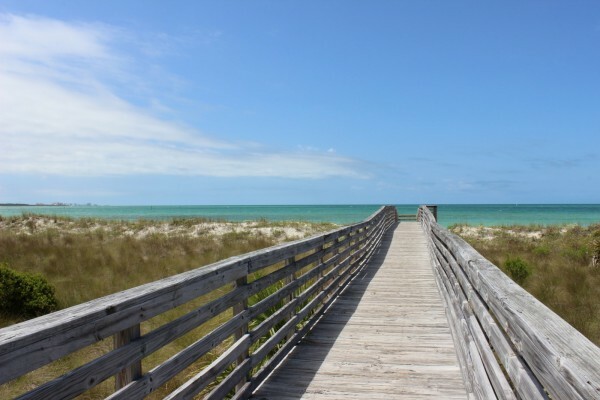 Peruse the photos and helpful narratives, then go check out our favorite spots! 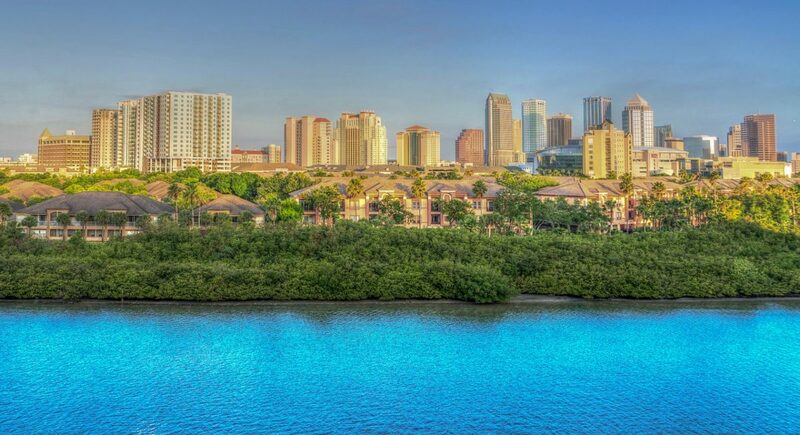 Pristine waters, wonderful wildlife, and some truly impressive vistas, there’s plenty of fun things in Tampa Bay, Florida for you and your whole crew to relax the days away. 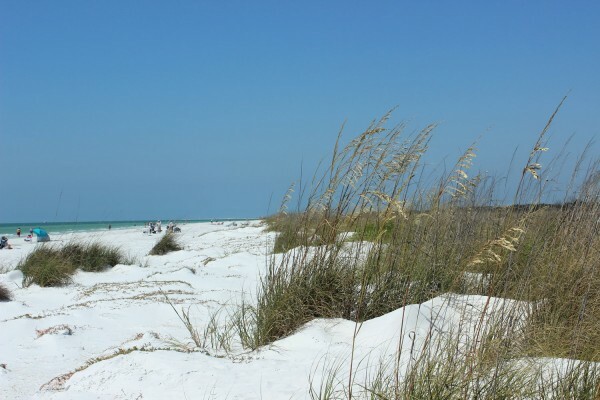 You can soak in the elegant gulf views of Honeymoon Island. 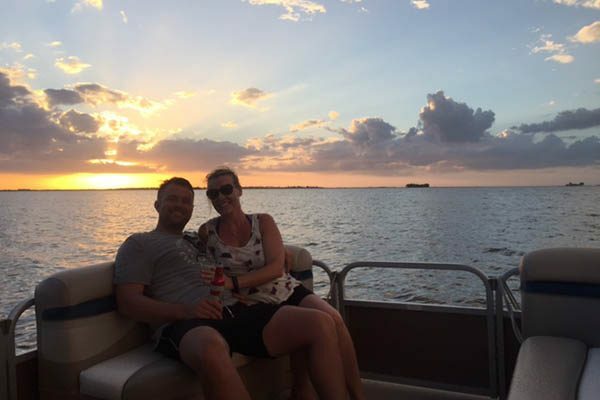 Visit late in the day for a romantic trip along the water. 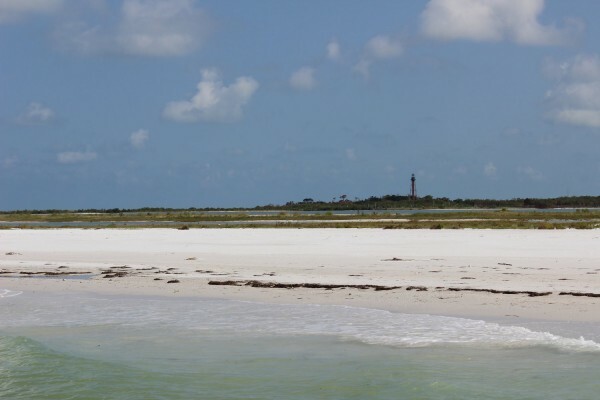 Kayak or cruise along waterways of Caladesi Islands State Park. 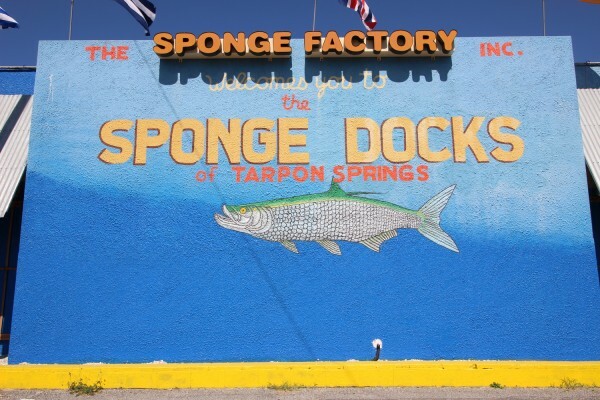 Hike the trails of Wall Springs Park or fish over by the Old Florida-styled Tarpon Springs Sponge Dock. 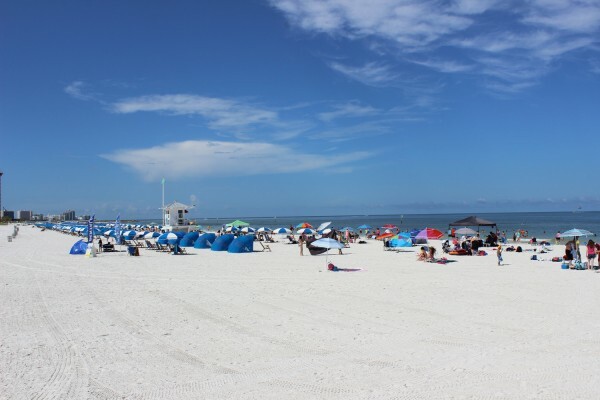 You can even dip on over to Clearwater Beach for what is possibly the brightest and most sprawling sandy beaches on the gulf coast. 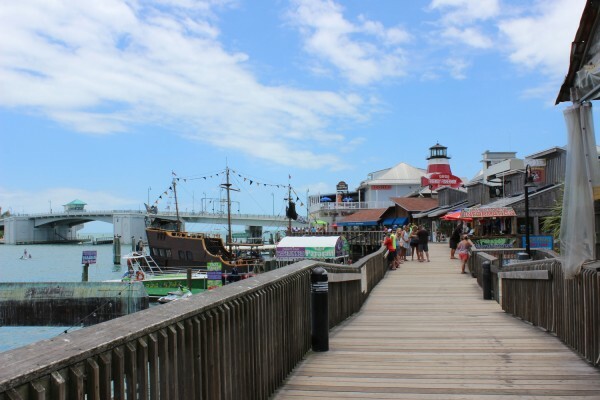 Hit the Jolly Trolley for an enthusiastic tour of the town. 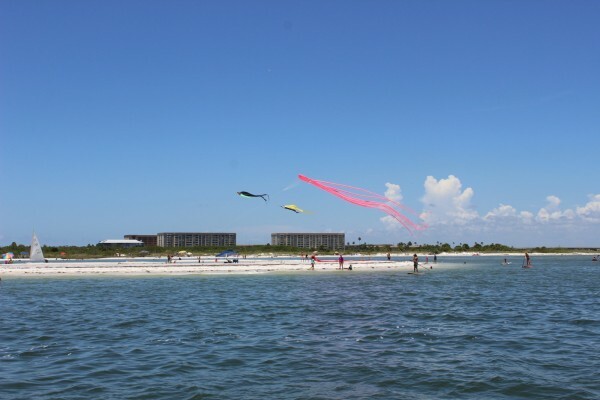 You can have a blast with many family friendly activities near our Tampa Bay rentals. 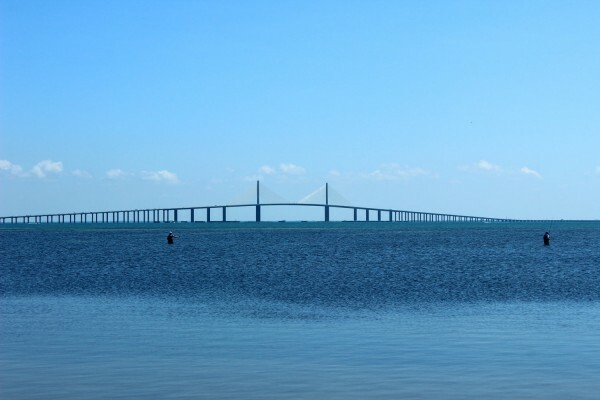 We want to offer more than some simple vacation rentals near Tampa Bay. 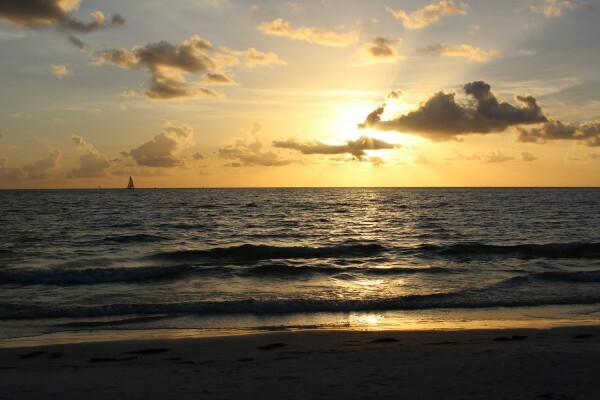 We help provide you with a real travel experience. 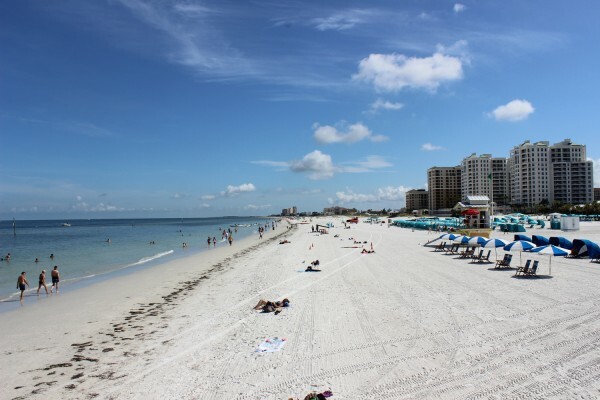 Our Tampa Bay beach vacations have some enthralling features just for you. 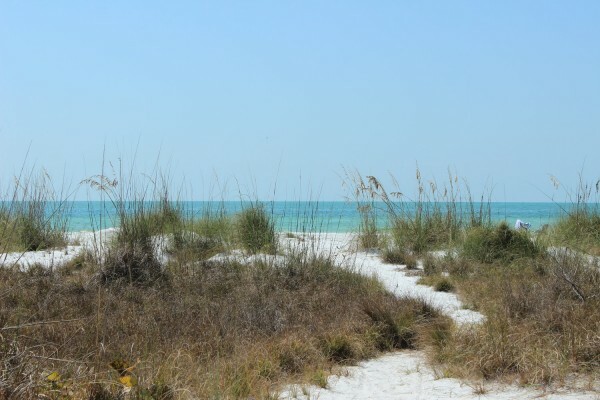 Many activities right around the corner, from relaxing on the golf greens to hiking through wetlands, playing competitive tennis and seeing theatre. 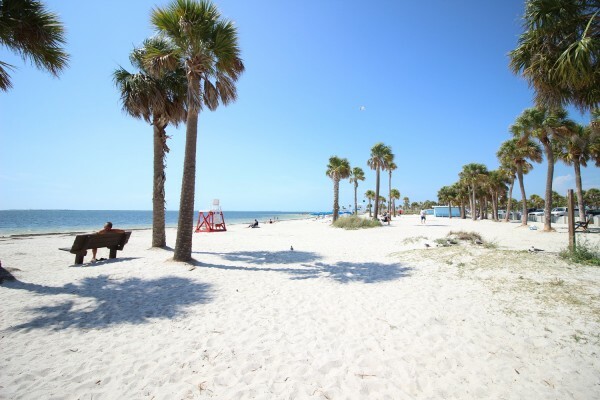 Beach vacations in Tampa Bay don’t get any better. 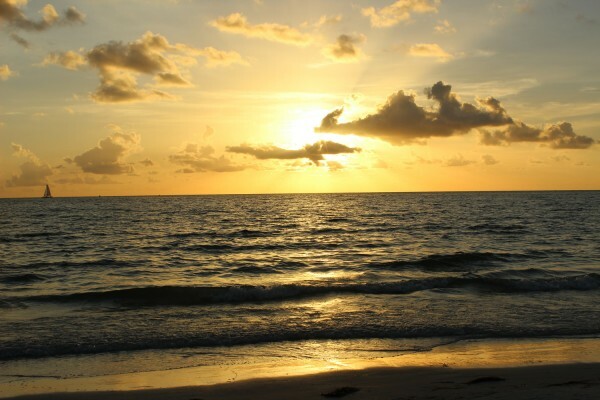 You can see – and do – it all while staying at one of our luxury rental vacation homes. 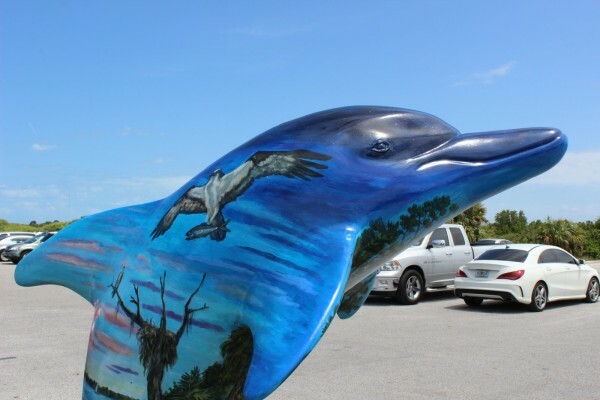 Voted best beach in America and the setting for the movie Dolphin Tale. 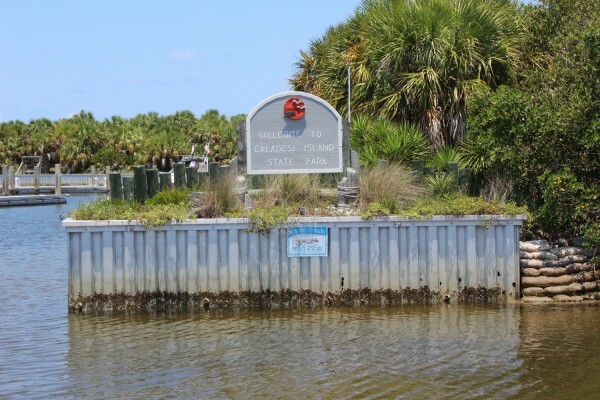 This popular state park is well known for its beaches, but the natural oasis has great parking, offers an abundance of water activities, including kayaking, canoeing and fishing along with nature trails and an interpretive center. 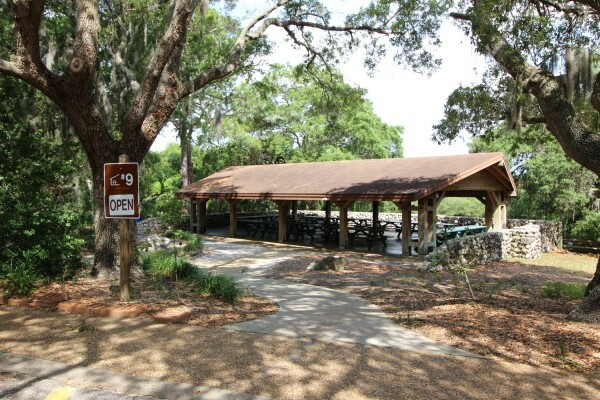 The facilities are top notch with bathrooms, showers, two restaurants and playgrounds. 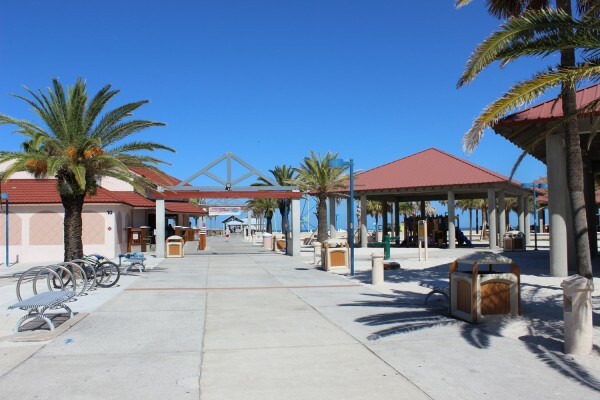 The pet beach is a pet friendly area that is not to be missed. Americas first three time gold medal winner in 1999, 2005, and 2013. 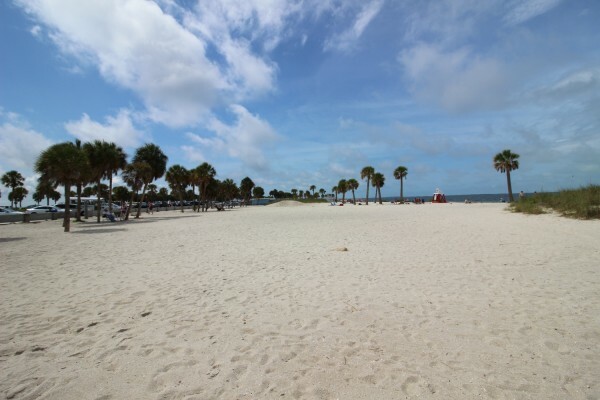 This park and beach is a great place to spend the day. Hop aboard the Caledesi Connection for a day at Caledesi Island. 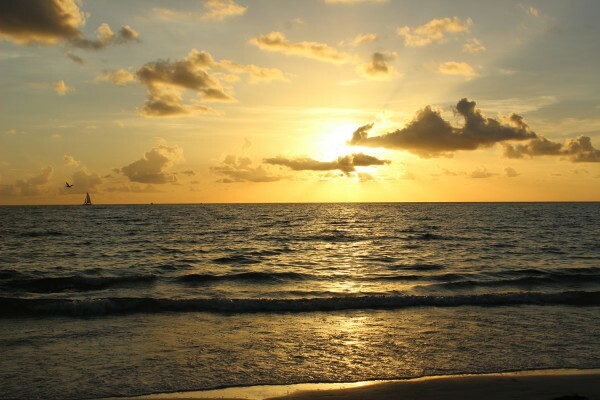 See our collection below on Caledesi Island. 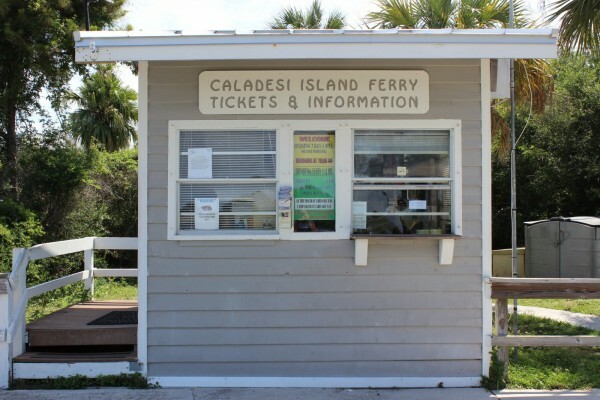 Located at the entrance to the ferry that will take you to another gem Caladesi Island. 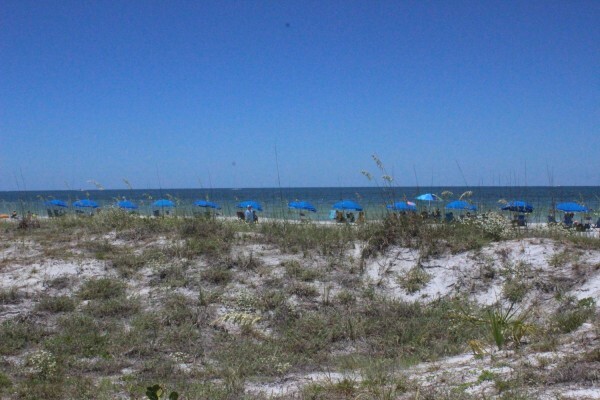 Another great beach and place to spend the day. 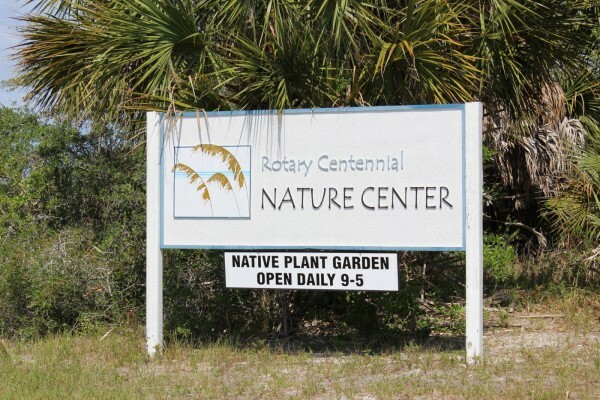 If your into amazing interpretive activities this is the place to be. 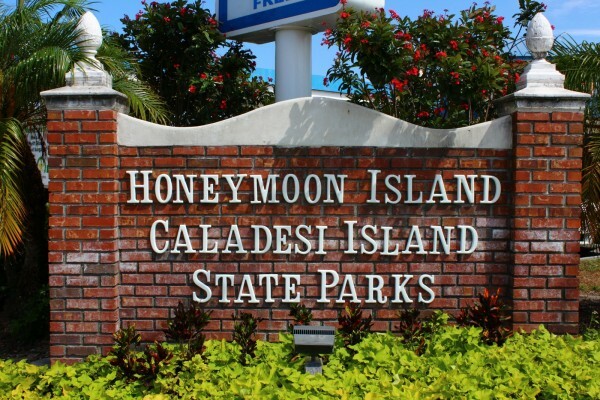 Click on the Honeymoon Island website to see what is being presented as it varies throughout the year. 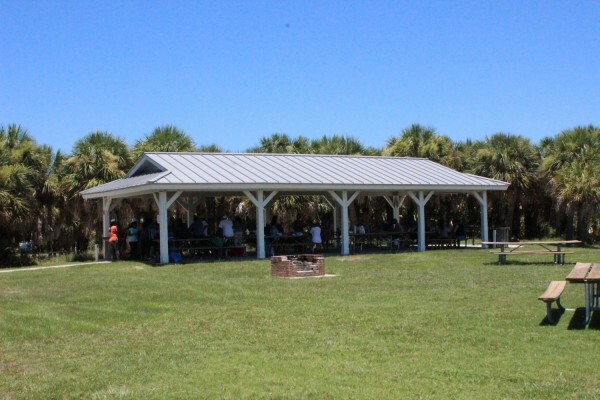 The island has numerous picnic pavillions and great facilities for large gatherings, weddings, or special events. 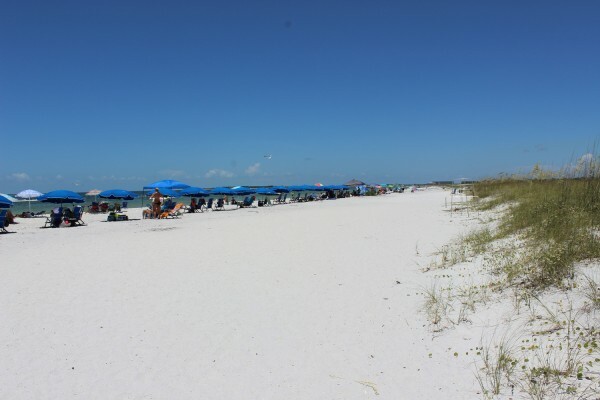 The Pinellas County Parks System has done a great job providing clean facilities for your use. 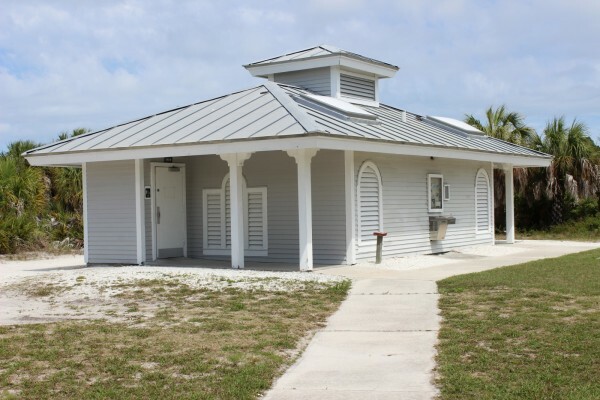 There are a number of these facilities on the island located near the playgrounds, shelters, and at the beach. 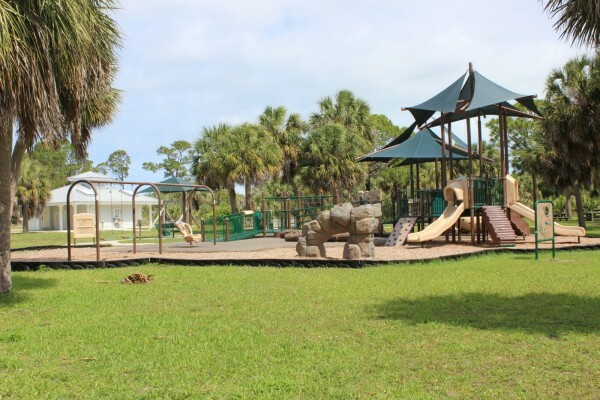 The little ones will enjoy countless hours playing at the expansive playgrounds right next to your favorite picnic spot. 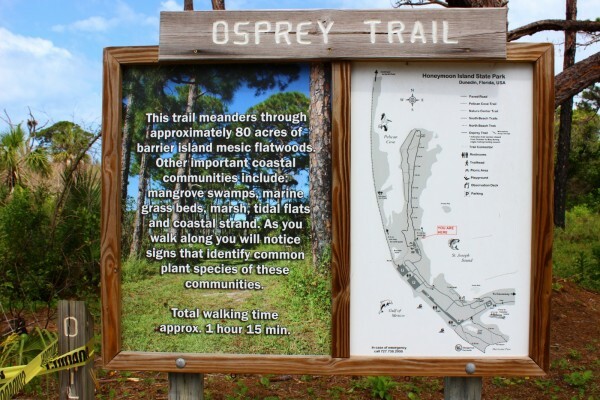 The Osprey Trail is a 2 mile trail through the flat woods section of the island with many informational and scenic stops throughout. 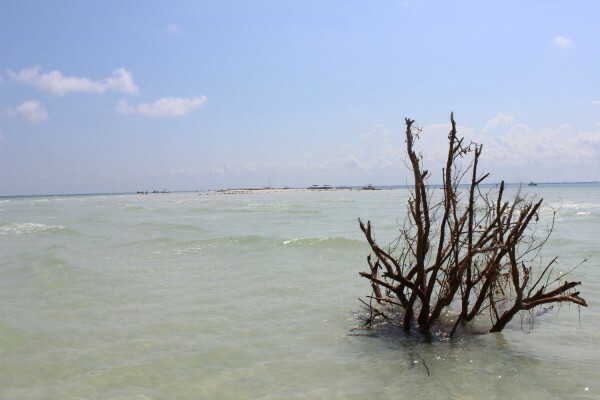 See the different plant species and wildlife on the tidal flats, mangroves, grass beds and coastal strand. 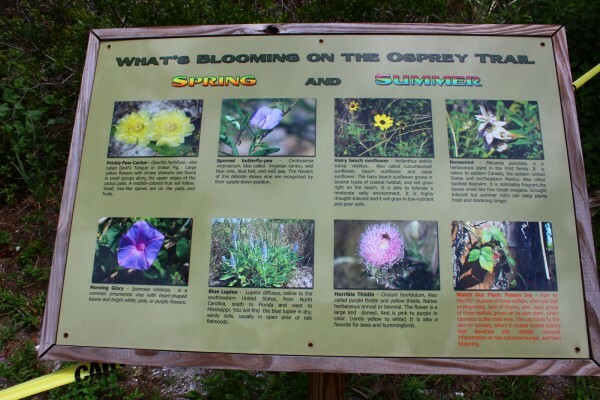 See many plant and animal species through the seasons on the trail. 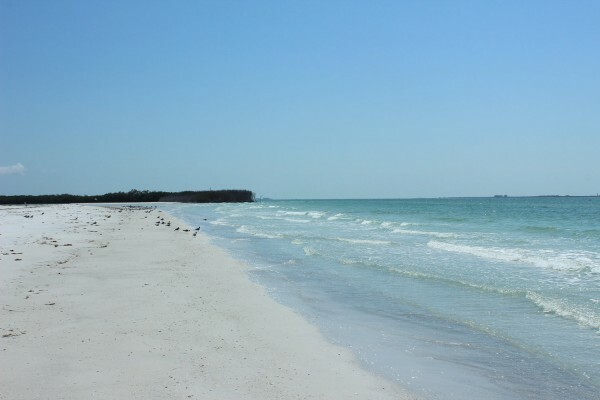 Honeymoon Island has four distinctive sections of beach, North Beach, Oasis Beach, South Beach and the Pet Beach. 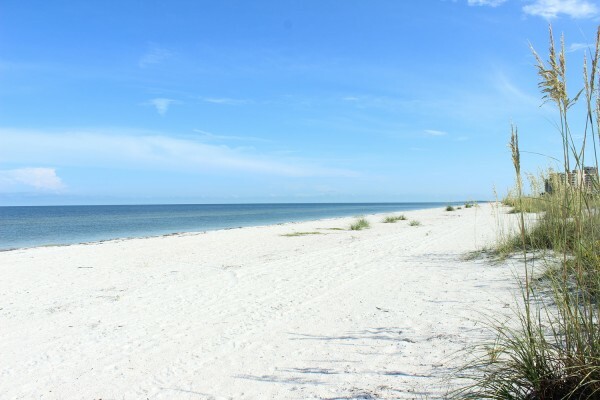 The island contains over 4 miles of beaches and this section on the North Beach is one of my favorites. 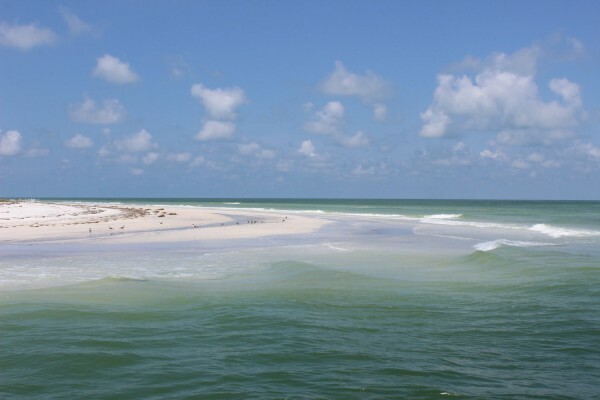 Many species of fish inhabit the waters surrounding Honeymoon Island. 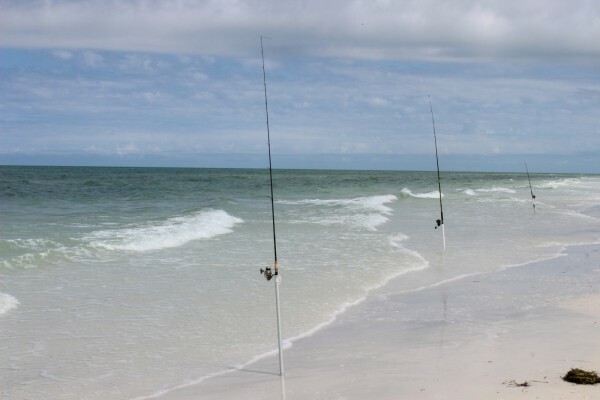 Fishing is a great way to spend the day on the beach. 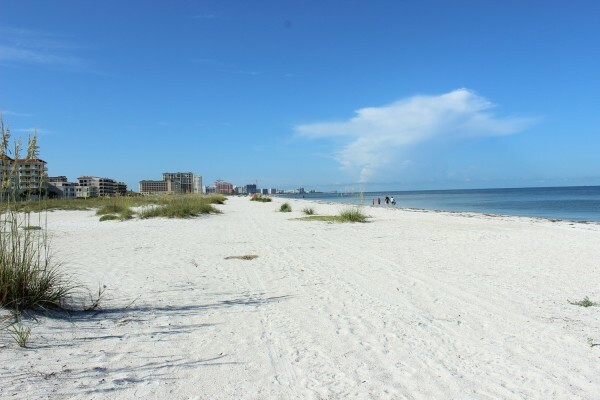 This photo was taken on the North Beach and in the distance can be seen Clearwater Beach. 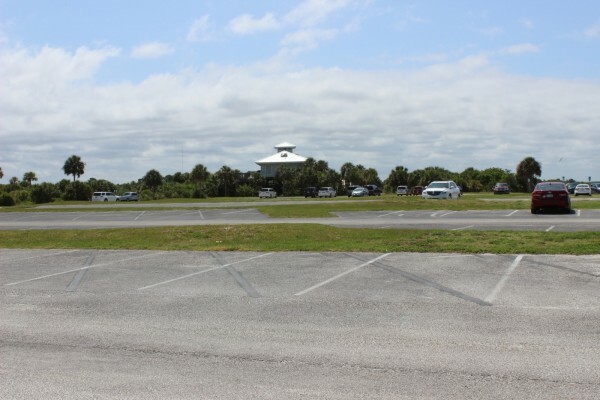 One of the benefits at this park is the ample parking. 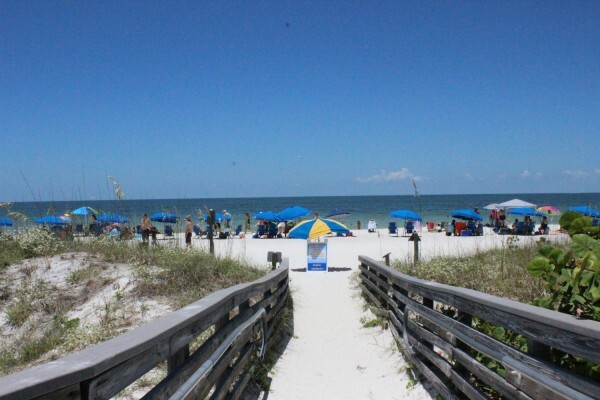 Rarely is there not enough parking and the parking is just a stones throw from the beach. 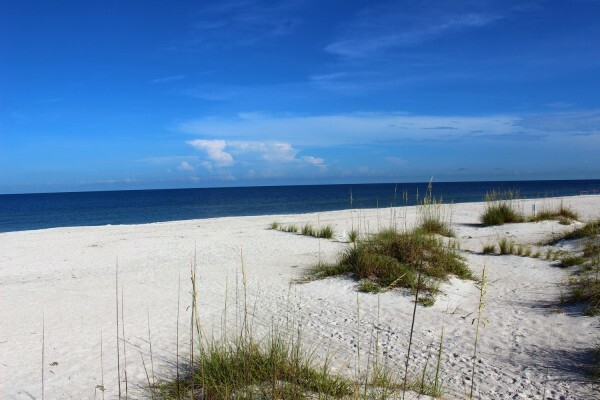 Relax on the shores of the Gulf of Mexico. 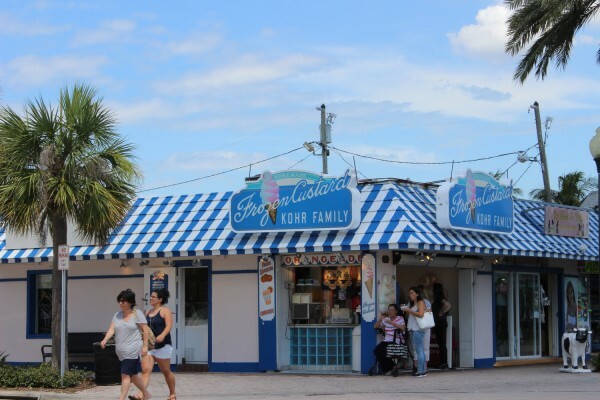 The South Beach Cafe serves up food all day. 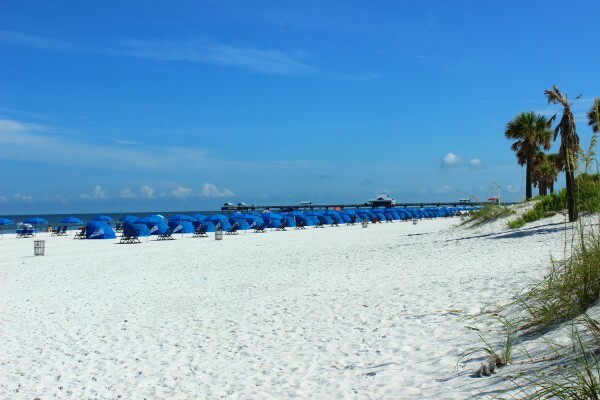 There are also storage lockers, chariot rentals, and excellent restroom facilities. 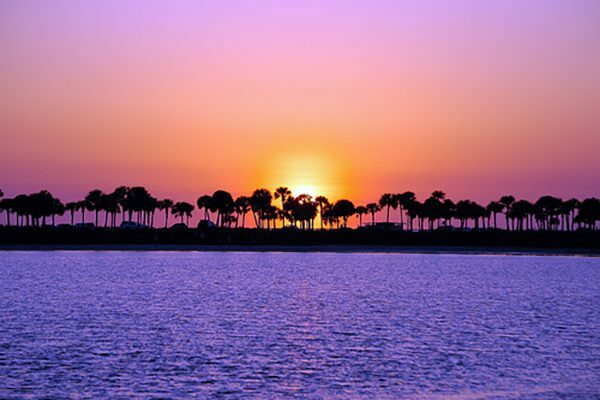 Just one of the reasons this park is a three time gold medal winner. 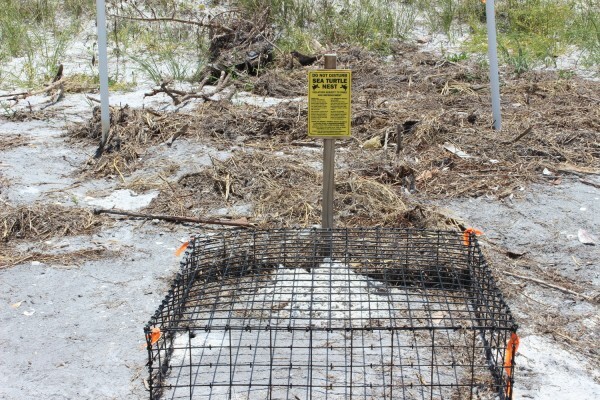 These off limits areas are essential to prevent beach erosion and are habitat to many species of birds, turtles and other animals. 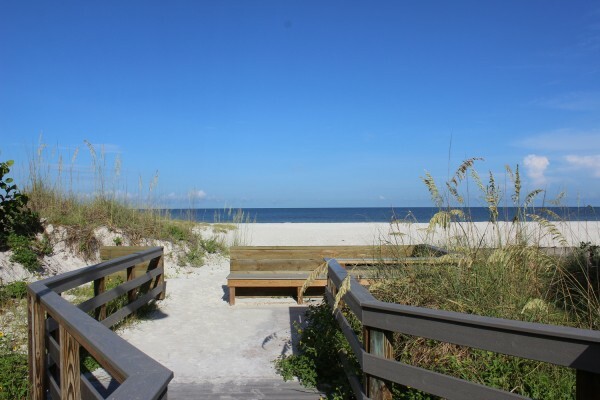 You can pull up to the beach and park next to the many walkways for convenient access. 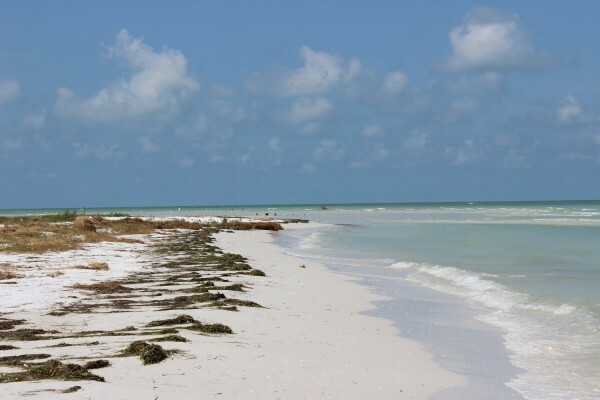 Popular among locals and travelers alike is the pet beach at the southern tip of the island. 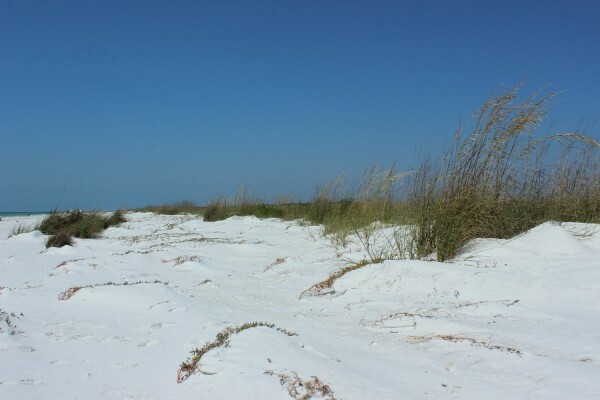 Some of the best exploring trails and white sand exist here. 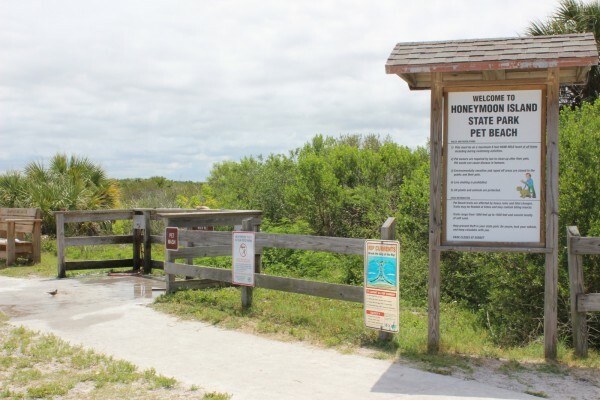 Do not miss the pet beach and bring your dogs. 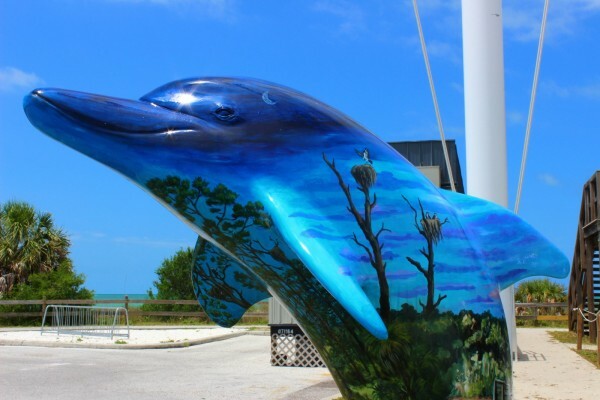 This is one of two dolphin statues that are on the island. Remember where the other one is? 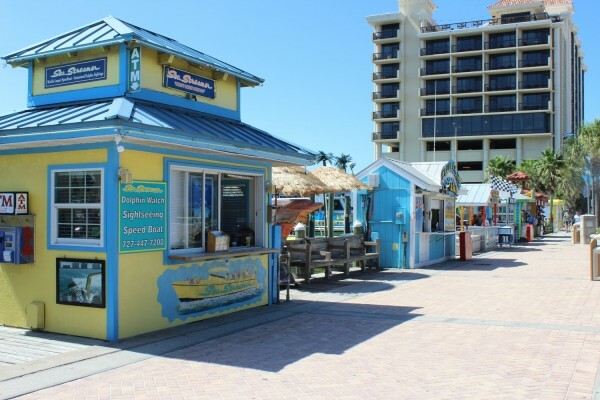 The south beach cafe offers open air dining choices with spectacular views of the waves and surrounding areas. 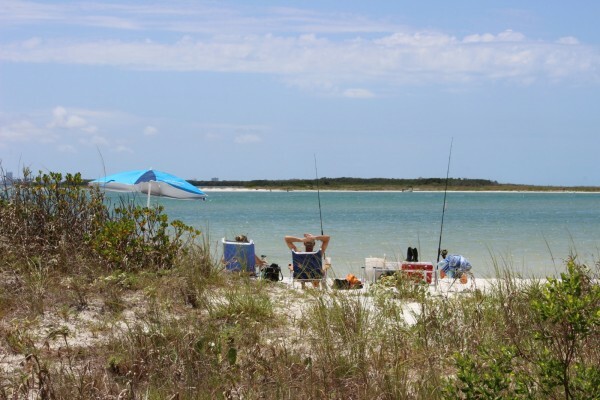 You can fish at all areas of the beach except for the main beach. 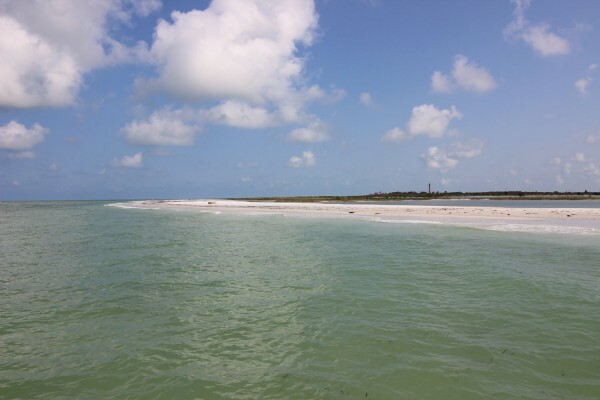 The waters surrounding Honeymoon Island are ideal for kayaking. 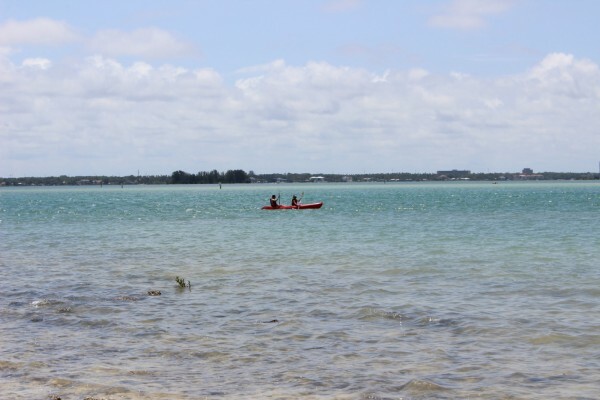 There are kayak rentals on the Dunedin Causeway just before the entrance to the park. 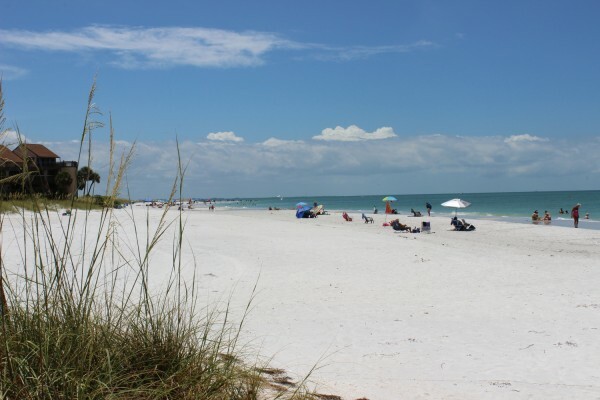 This section of beach is one of the best spots in Pinellas County and one of the least known. 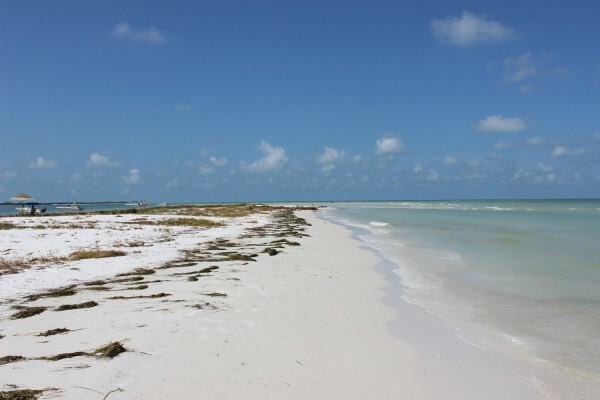 It is all the way at the end of the pet beach trail at the furthest most southern end of the island. 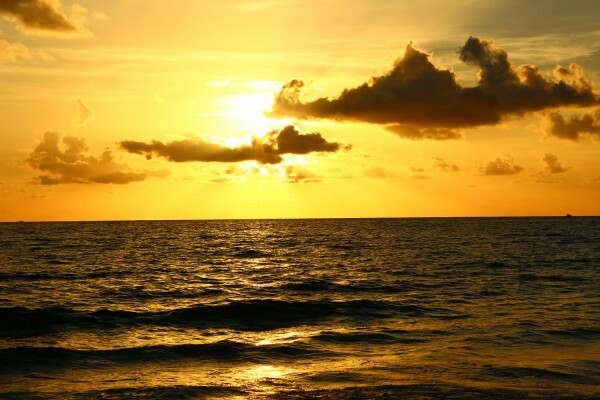 Warm calm clear water awaits you. 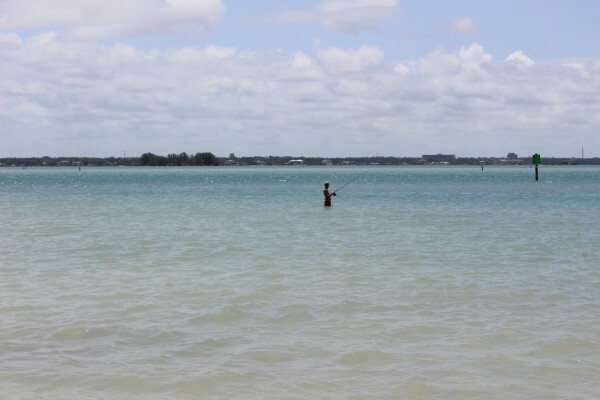 This photo is from the water of the furthest most northern tip of the island. 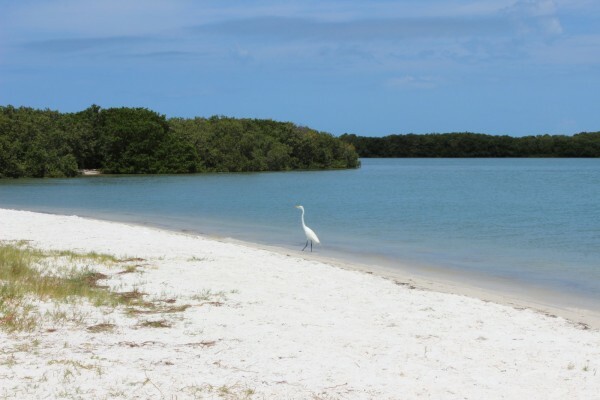 Just a few minutes by ferry is this spectacular park and beach. 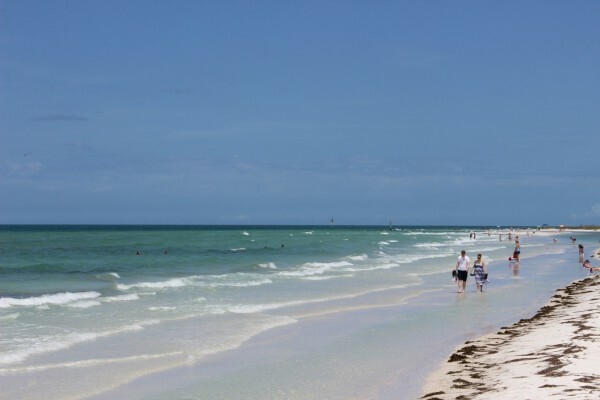 Not to be missed on a trip to Florida. 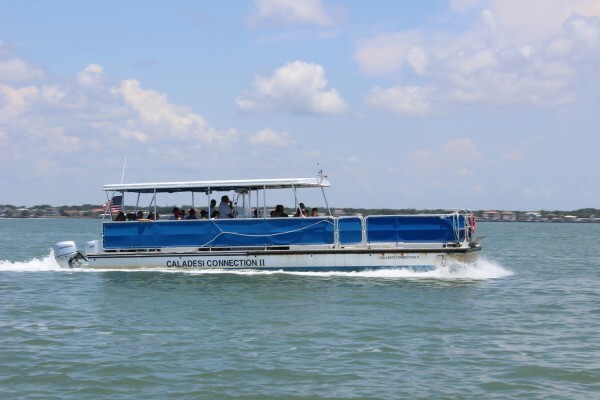 This is the Florida version of a ferry that takes you from Honeymoon Island to Caladesi Island. 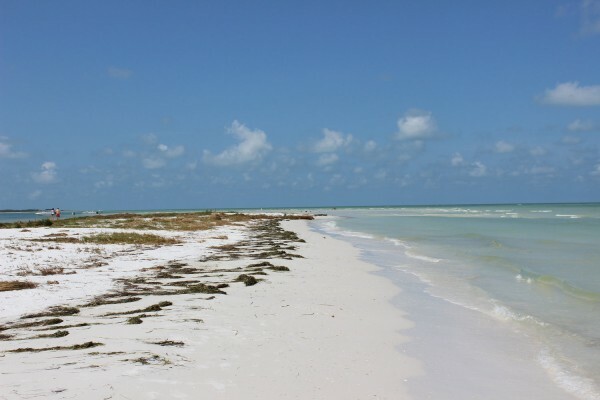 Caladesi Island was Dr. 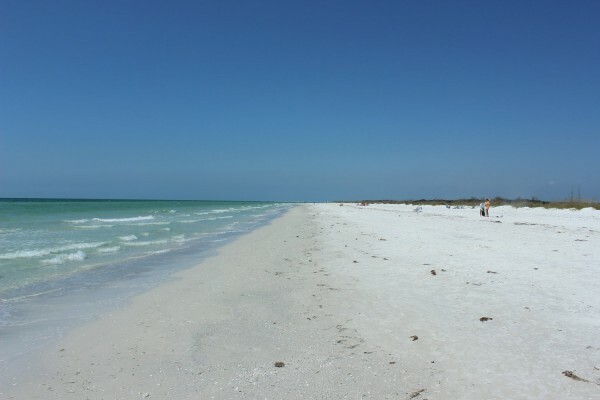 Beaches best beach in America in 2006, 2007, and 2008. 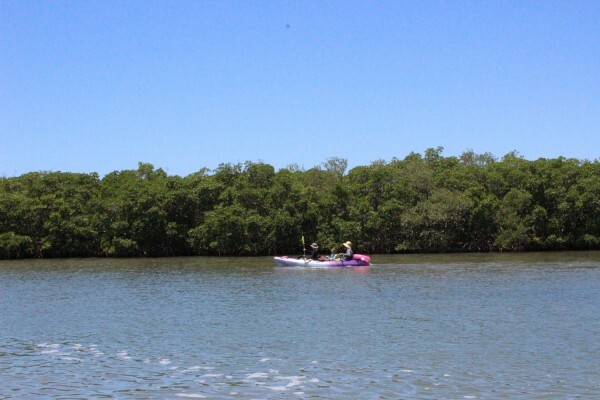 Many people kayak the mangroves around Caladesi Island due to the calm warm waters and abundance of wildlife. 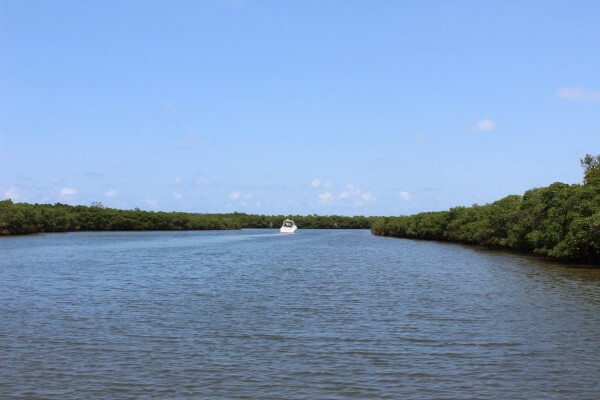 This island has many mangrove lined waterways for fishing and kayaking. 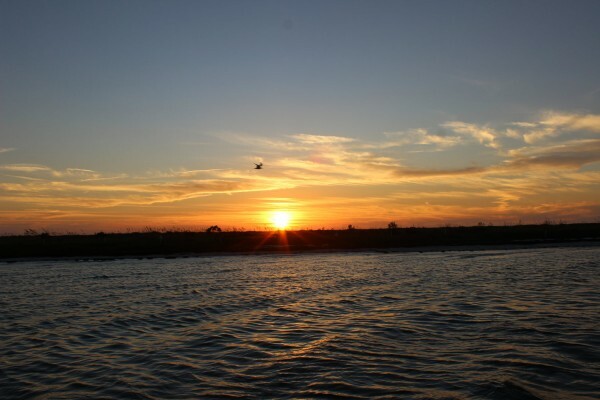 Numerous species of fish inhabit these waterways and they are favorites spots for local fish guides. 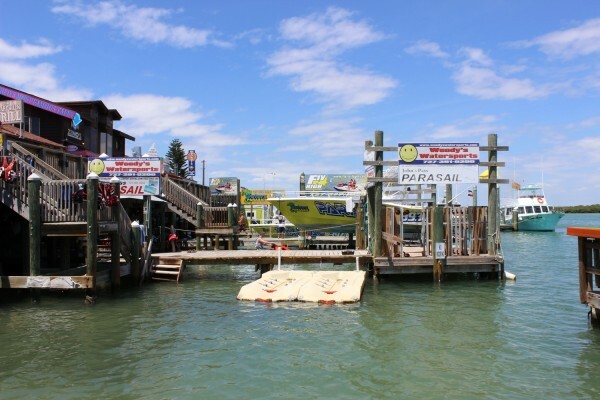 The Caladesi Island marina can accommodate large boats and has fresh water, electricity and lighting. 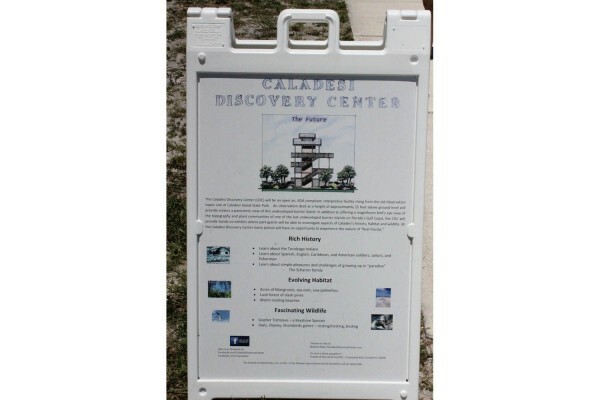 Caladesi Discovery Center in the works will offer interactive events, interprative center and observation tower. 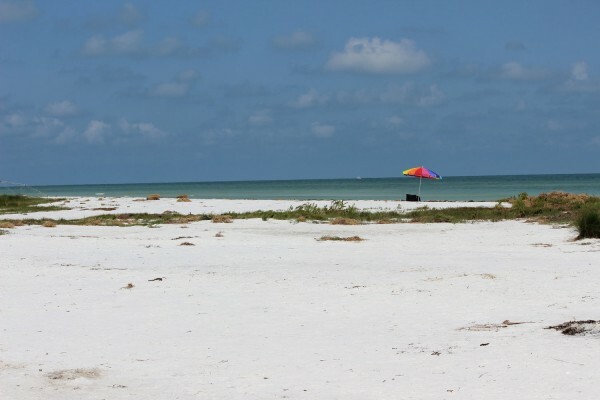 As with most parks in Pinellas County, Caladesi Island offers many shelters for that special event. 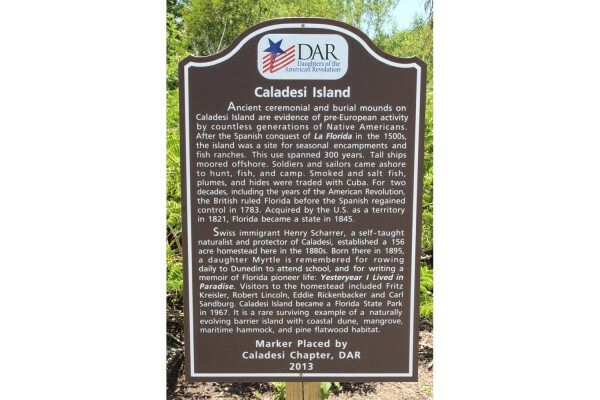 The rich history of Florida's west coast barier islands can be learned at Caladesi Island. 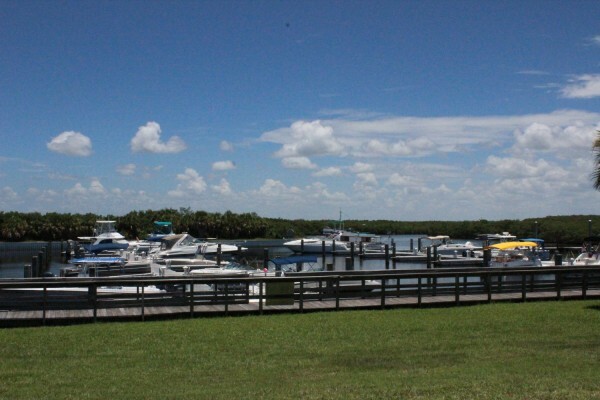 Caladesi Marina has wonderful overnight docking facilites. 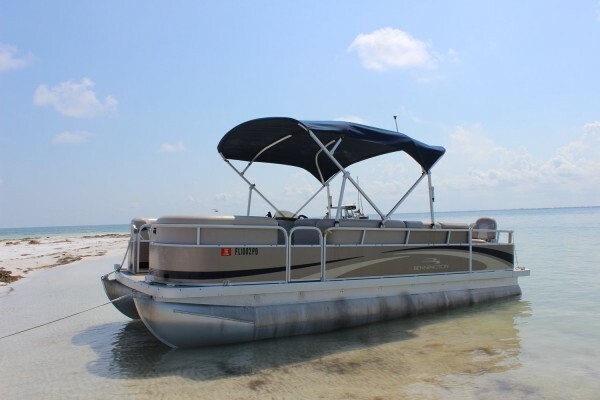 Popular amongst boaters who anchor on the beach for easy access and fun in the sun. 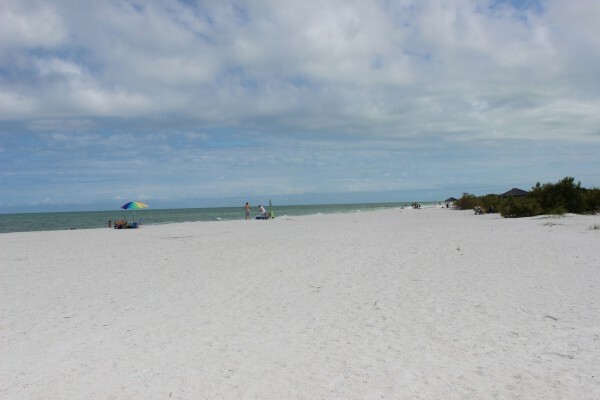 This beach is much less crowded than other areas and is one of my favorites. 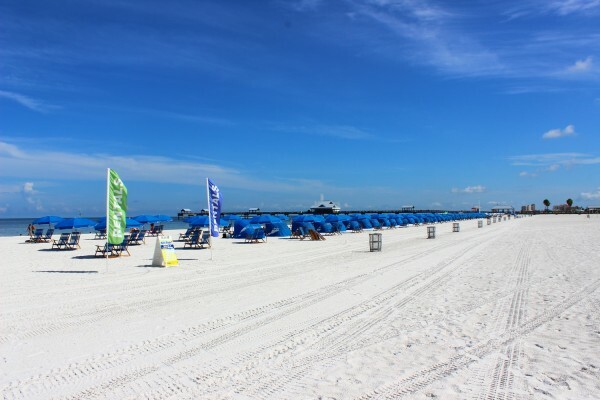 The beach master will set you up with a cozy umbrella and chairs, for a price of course. 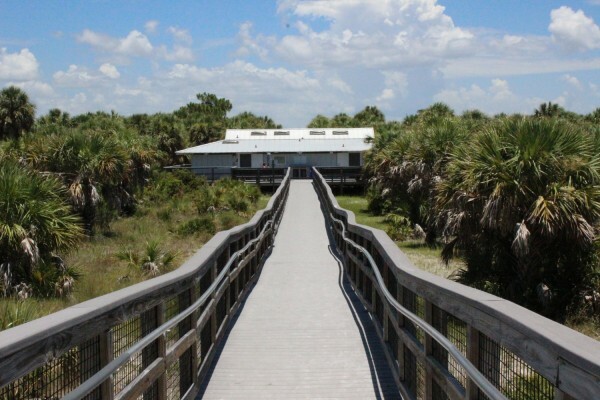 Many species of birds call this home and the spot is very popular among bird watchers. Top notch restrooms and showers to use once you force yourself to leave and catch the ferry home. 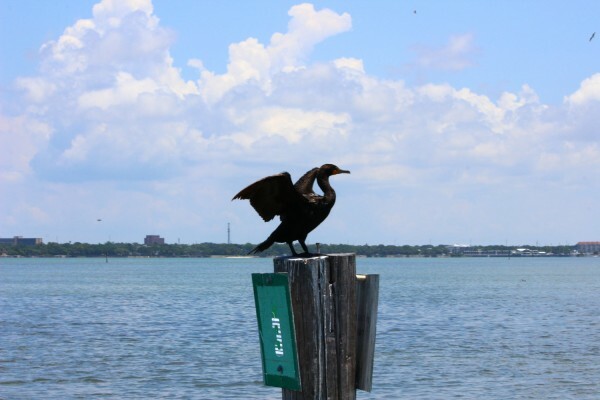 These amazing birds can be seen sunning their wings at the entry to Caladesi Island. 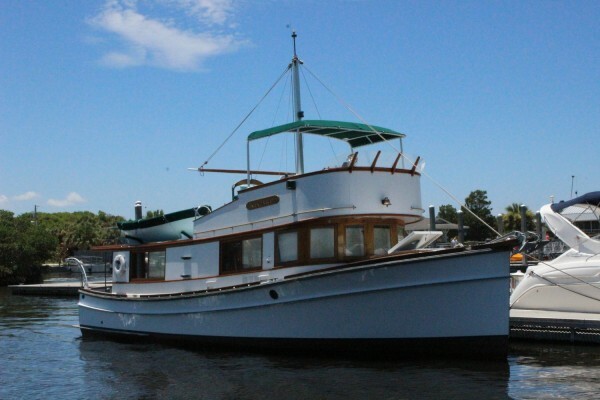 One also lives at the dock at Sutherland Manor. 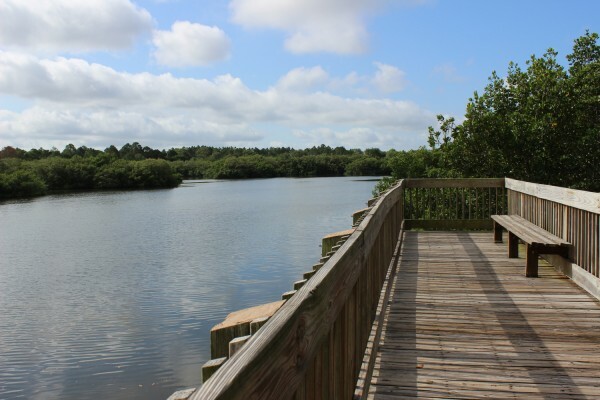 Fred Howard Park consists of 155 acres and is located on the Gulf of Mexico. 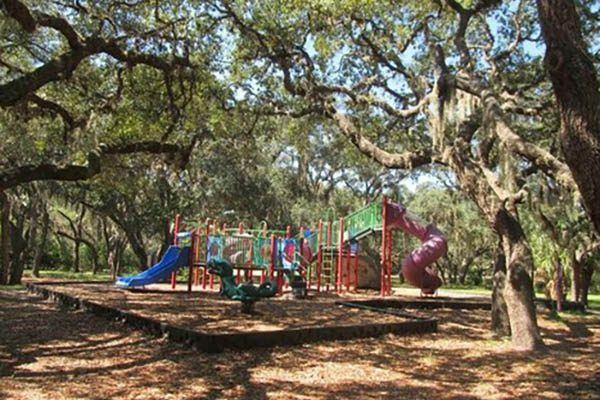 Almost 2 million visitors enjoy the park annually. 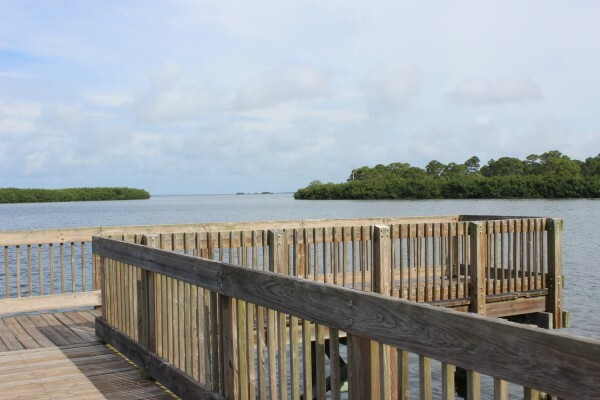 Howard Park's location provides access to the Gulf of Mexico by a 1-mile long causeway. 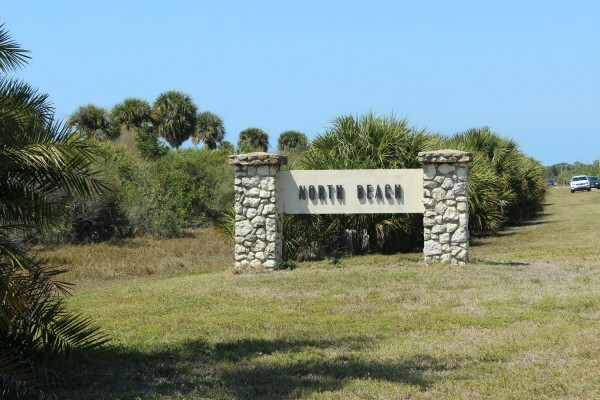 The white sandy beach is a very popular north county swim area and also provides a perfect location for visitors to enjoy many spectacular sunsets. 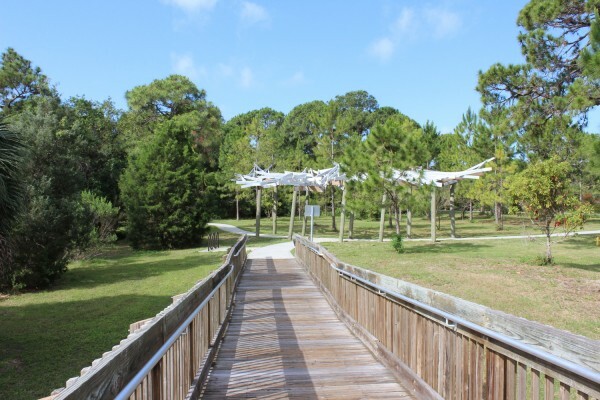 Nesting ospreys and eagles may be viewed by park visitors as they fish for food in the surrounding waters. 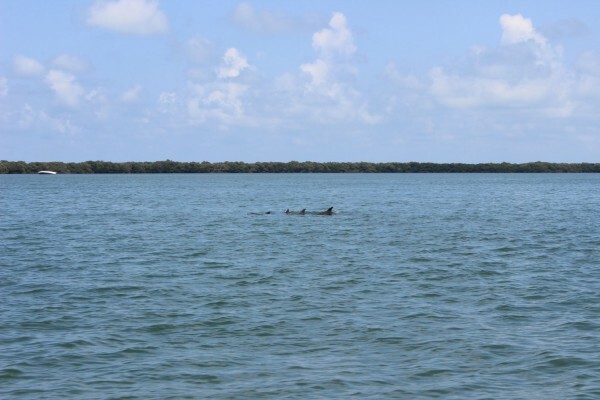 Dolphins, and occasionally manatees, are seen in the area. 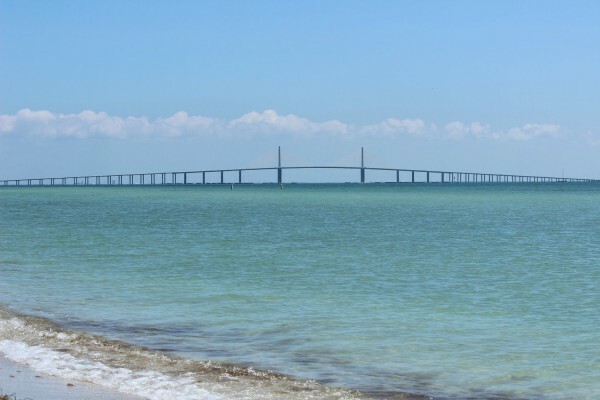 The causeway is used for sunbathing, fishing and exercising. 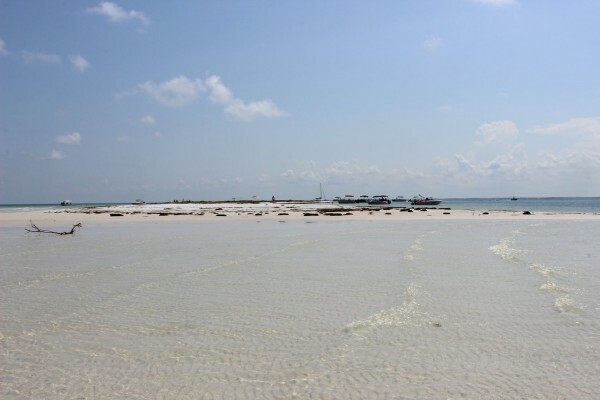 The white sand is perfect for sunbathing. 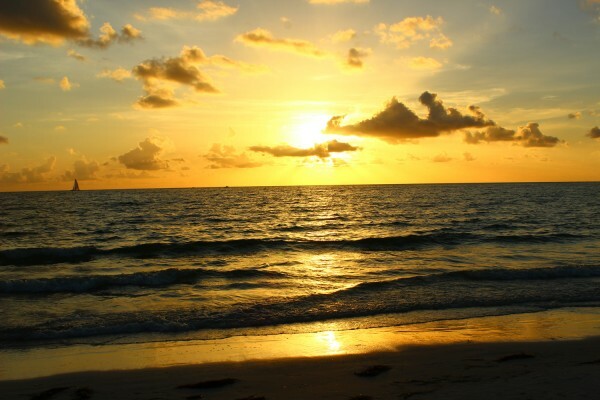 Nightly sunsets are a very popular attraction. 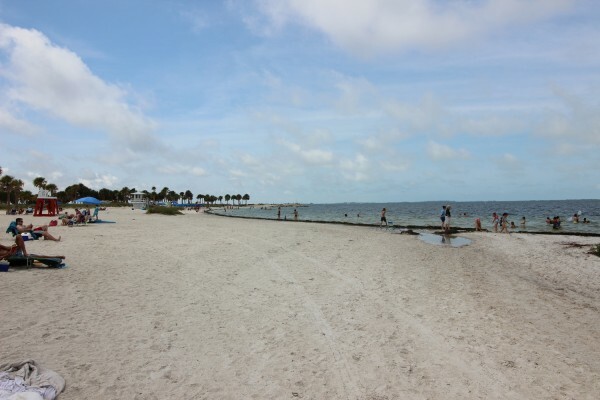 The swimming and snorkeling spots around the park are very popular due to the calm waters and protected no wake beach area. 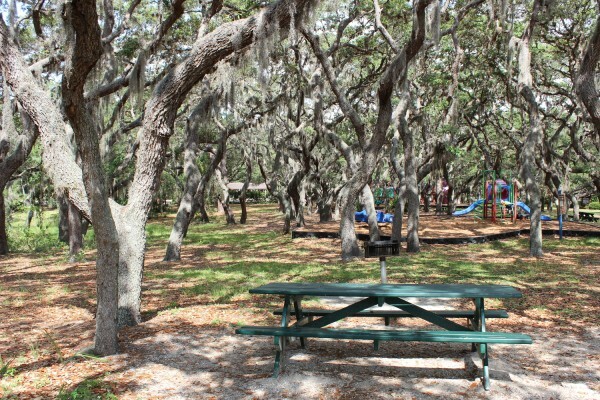 Picnic while children play on the playground equipment under cover of scenic oak trees. 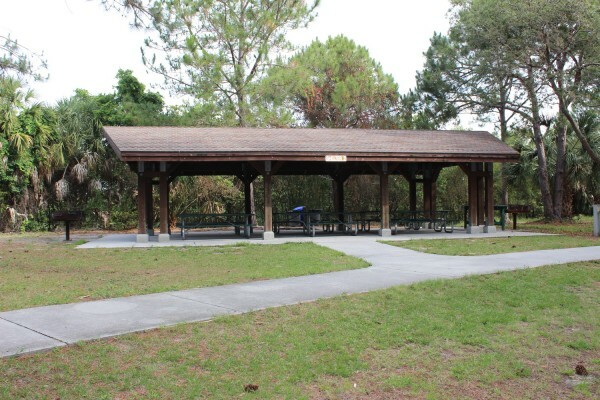 There are nine first come first serve picnic shelters at the park. perfect for weddings, birthdays, special events, and more. Seating for 40-60 people underneath protected shelter next to scenic waterfront. 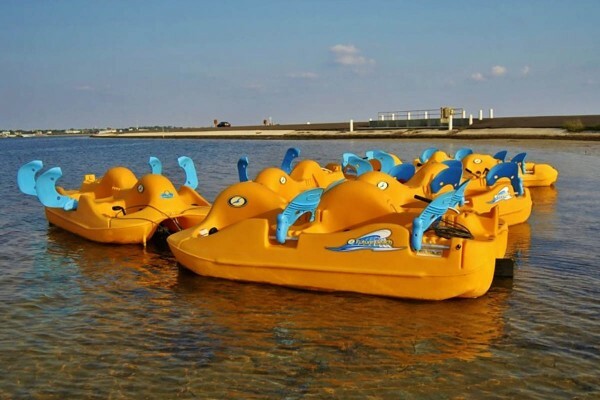 The park vendor has boat, surrey, bike, kayak and more rentals. 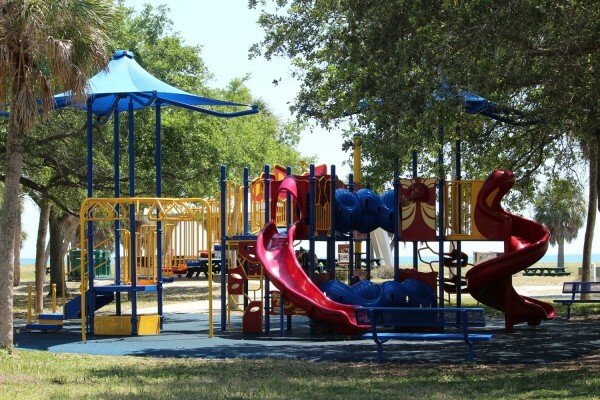 The park has high quality play equipment for the little ones in your group. 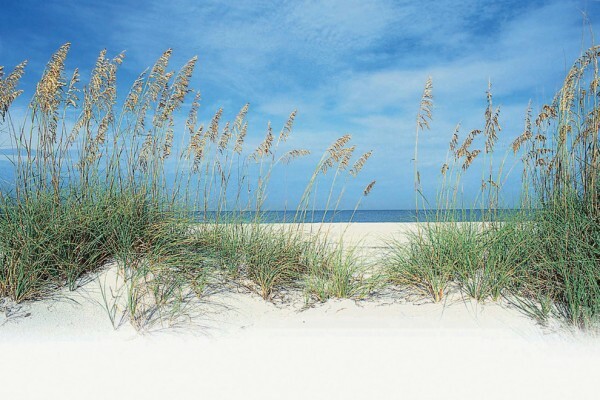 These protected plant species help with beach erosion. 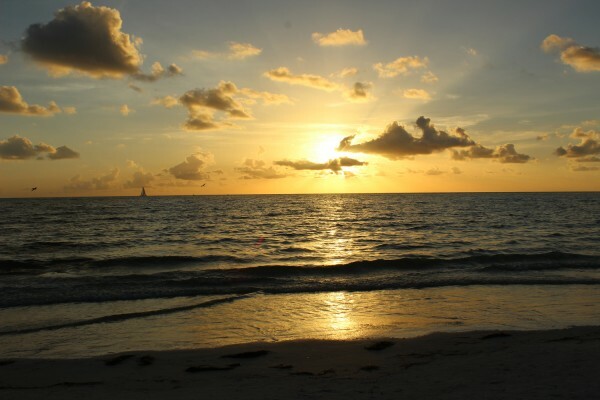 Don't miss the spectacular sunsets nightly. 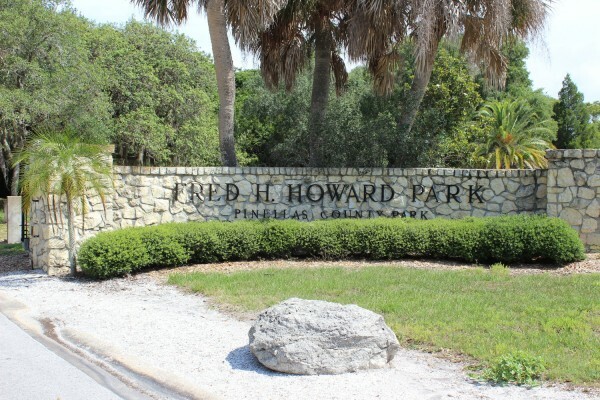 A fantastic park located on the Pinellas Trail in Palm Harbor, Florida. 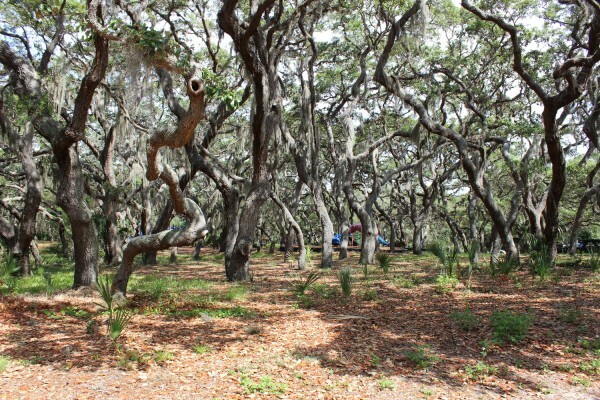 One of the best parks you will find anywhere. 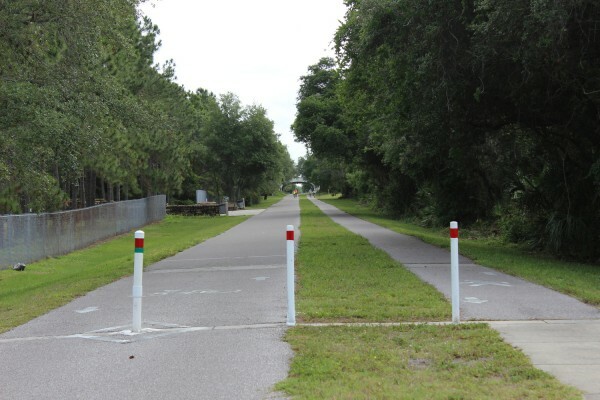 The Fred Marquis Pinellas Trail is a 47 mile linear park and recreation trail currently extending from St. Petersburg to Tarpon Springs and is a multi-use trail everyone can enjoy. 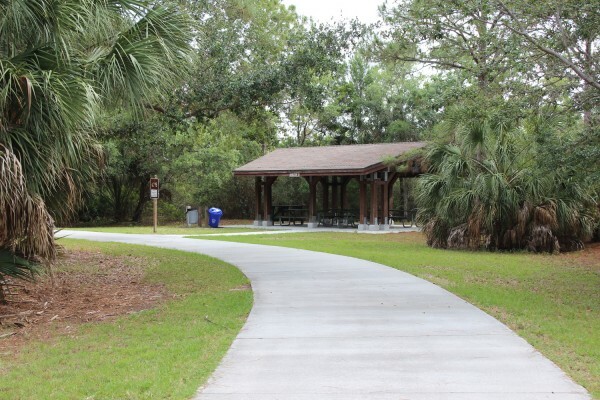 The Trail, created along an abandoned railroad corridor, provides a unique, protected greenspace for walking, jogging, skating and biking. 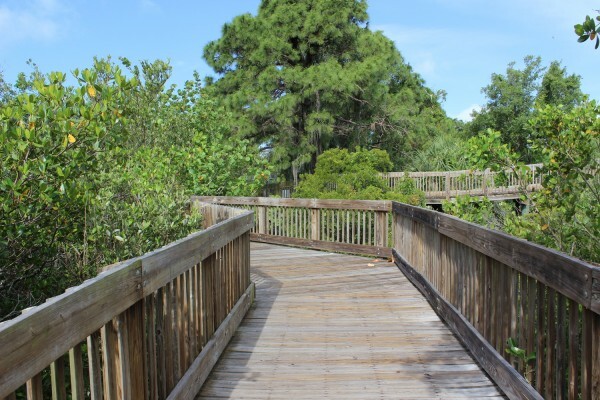 Pinellas County Parks & Conservation Resources is responsible for the Trails maintenance and operating costs. 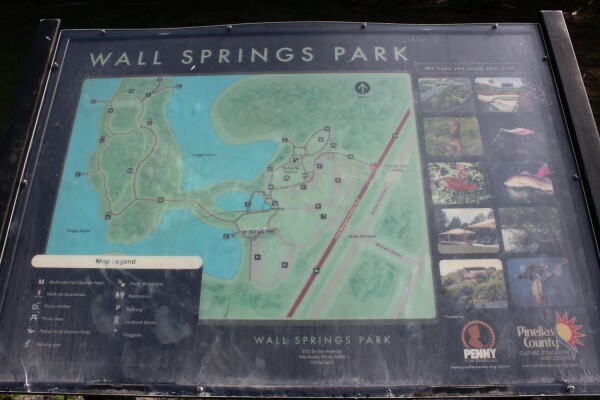 Walls Springs Park is just one stop on this trail. 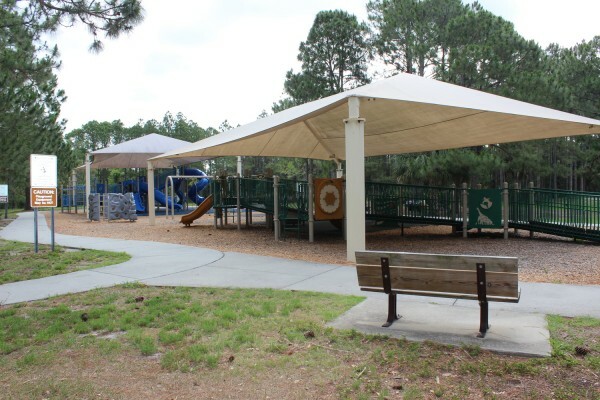 The fun continues in the park with a covered, barrier-free playground. 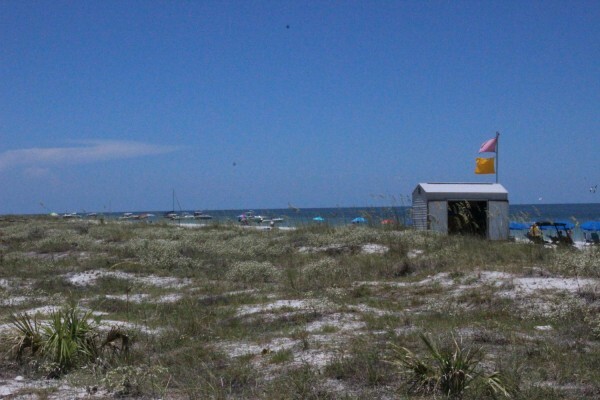 There are numerous first come first serve event shelters for your use. 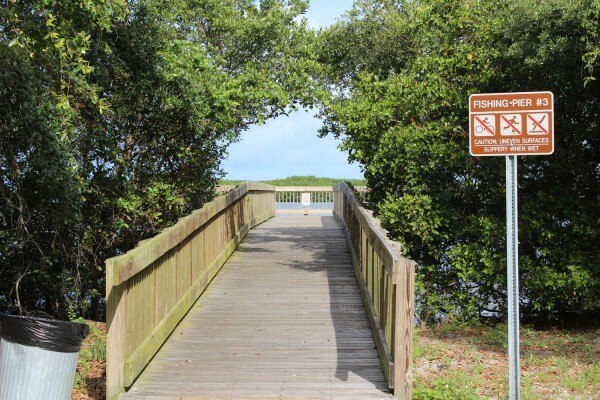 Some are located right next to the water and fishing piers while others are uniquely positioned in serene locations off the trail. Can you see the outline of the ladies head? 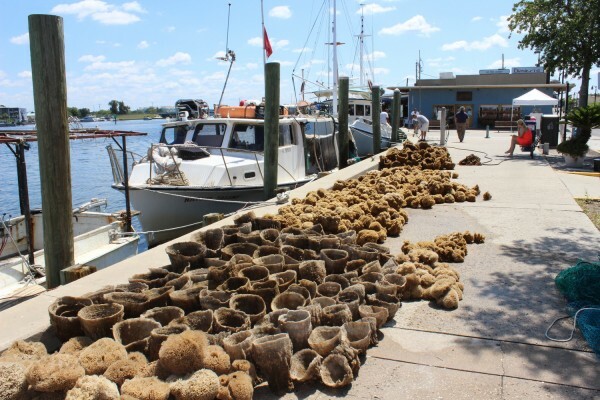 The springs have changed many owner hands over the years and has had many uses. 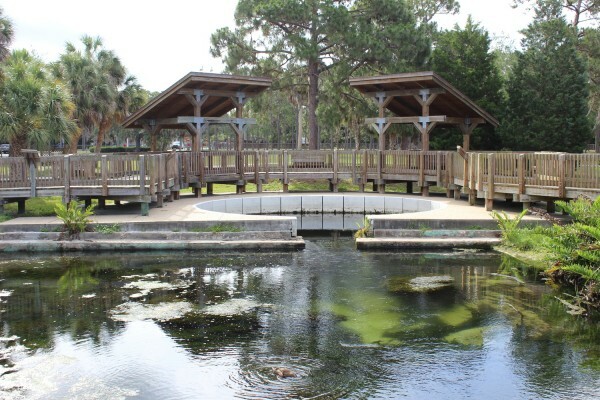 The spring and adjoining pond were used as a spa & bathing area from the turn of the 20th century until the mid 1960's. The flow varies from zero during drought to more than 7400 gallons per minute. 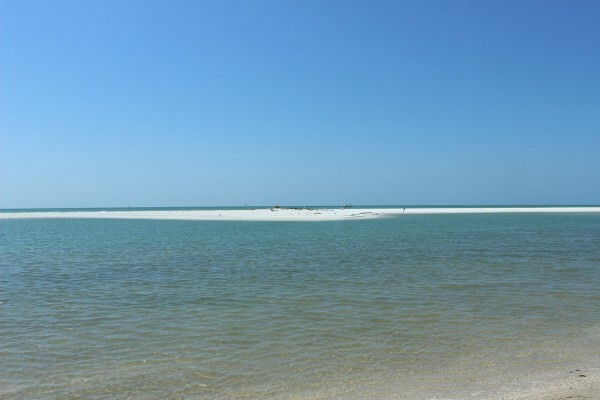 The spring releases into the neighboring ponds and ultimately the Gulf of Mexico nearly 2.4 gallons on an average day. 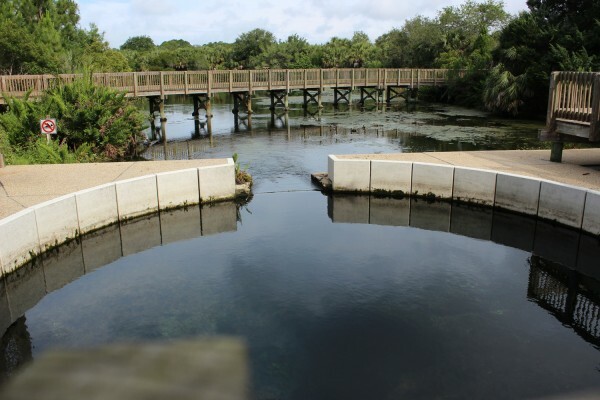 The spring became known as "Wall Springs" during ownership by the Wall family. 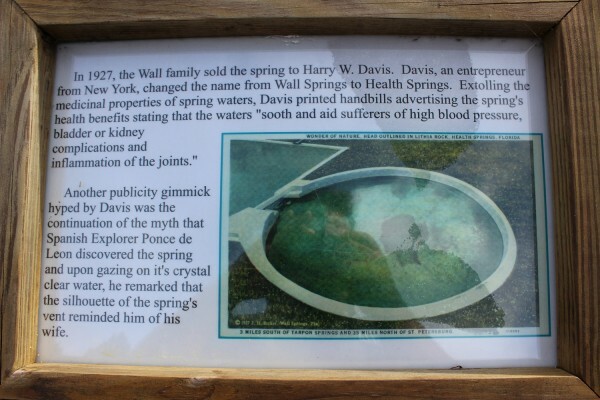 Once the property was sold to the Davis family the spring became known as "Health Springs" and was used as a health spa. 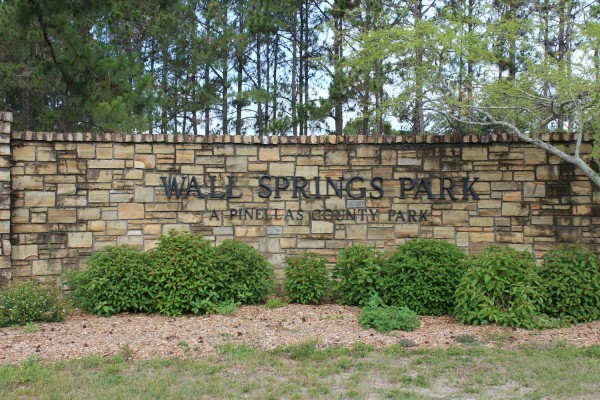 When the property was purchased by the Cullen Family on February 6, 1948 the spring name changed back to "Wall Springs" and the area was used as a recreational area until the mid - 1960's. 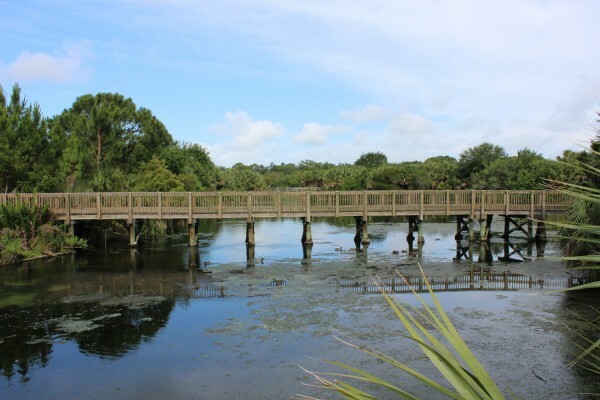 A historical, natural spring, once used as a spa and bathing area, complete with a viewing area, boardwalk and information display serves as the centerpiece of this 210 acre park that is connected to the Pinellas Trail. 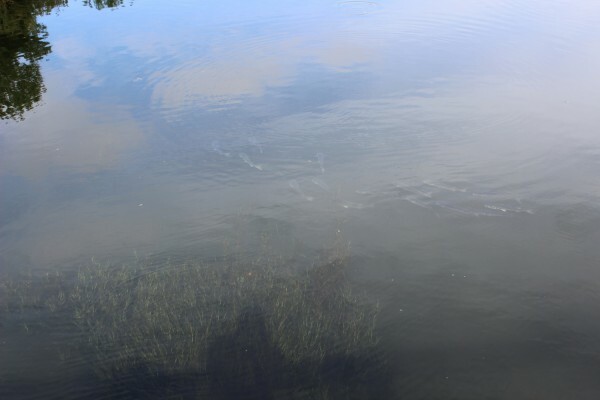 Very serene area of the park and filled with fish. 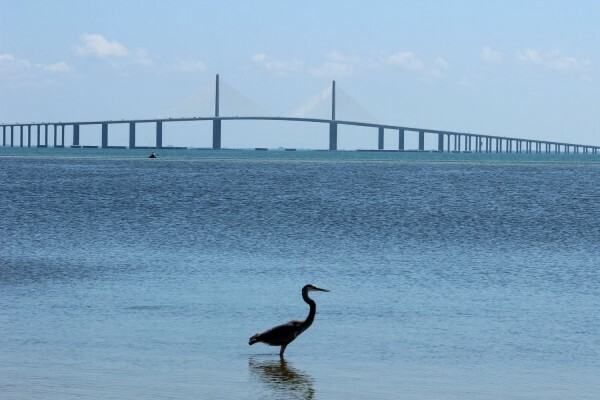 Many of the area birds and other wildlife make this their home. 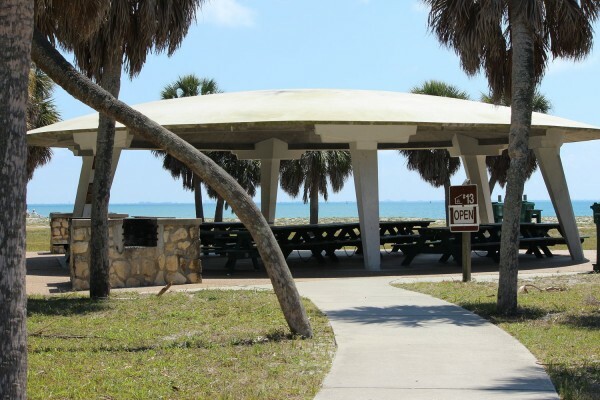 As with most parks in Pinellas County there are impeccably maintained walking trails and picnic shelters. 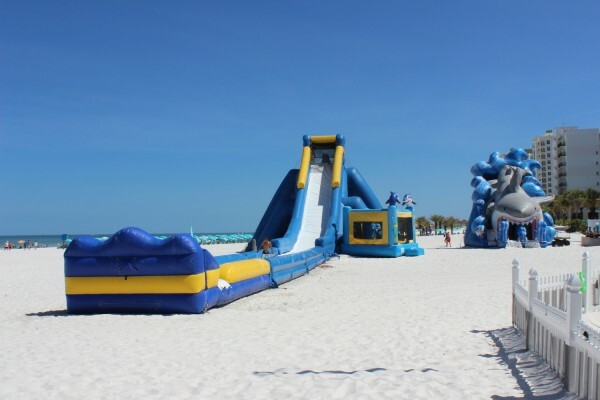 The areas are first come first serve and are great for special events. 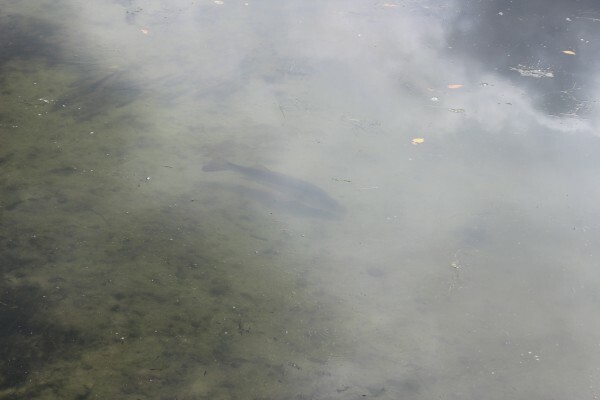 These fish are plentiful in the area and can be seen traveling in schools. 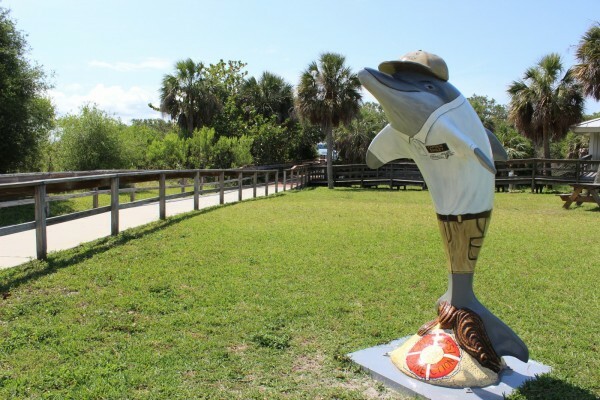 Fishing opportunities are endless at the park. 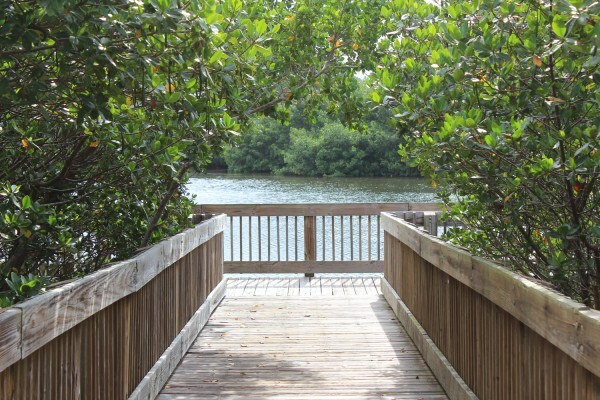 Many wood walkways take you through the mangroves and lead to fishing platforms. 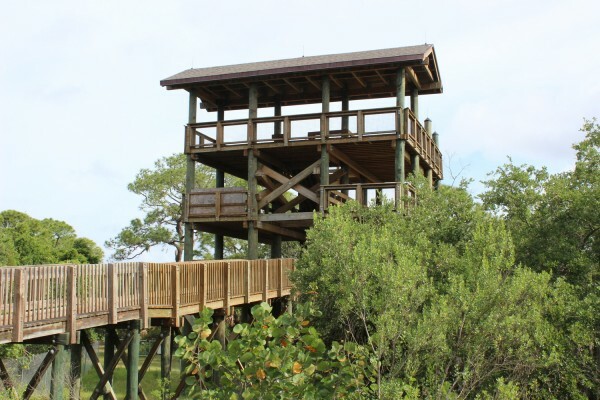 This is the new observation tower constructed recently. 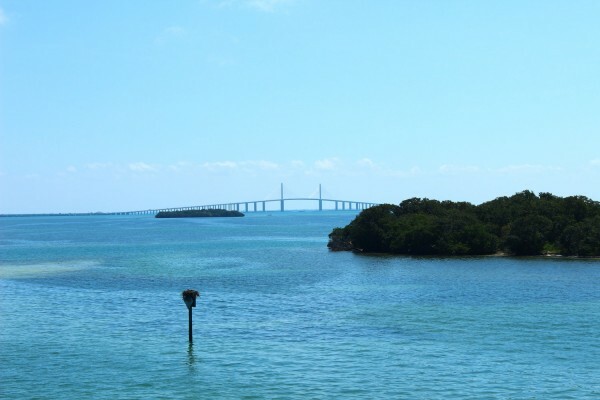 At the top of the tower you can see for miles and enjoy breathtaking views of evening sunsets. 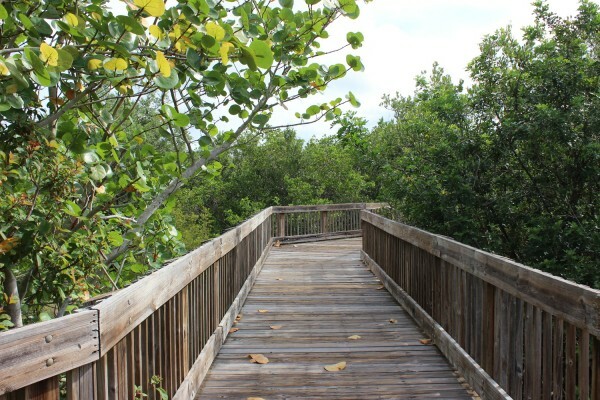 Many of these wooden walkways meander through the mangroves and end at scenic stops overlooking the surrounding waterways. 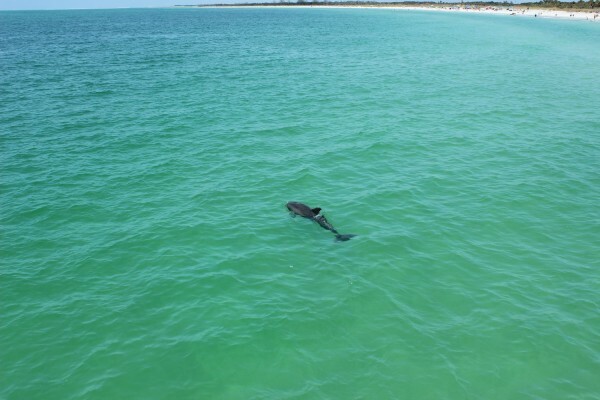 You will see a varied array of wildlife. You never know what you might catch. 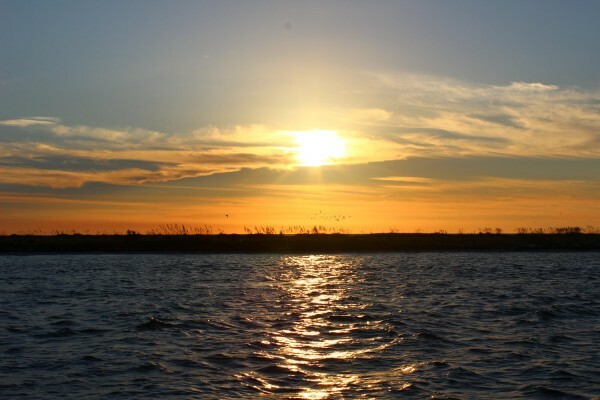 Snook, redfish, trout are all possibilities. 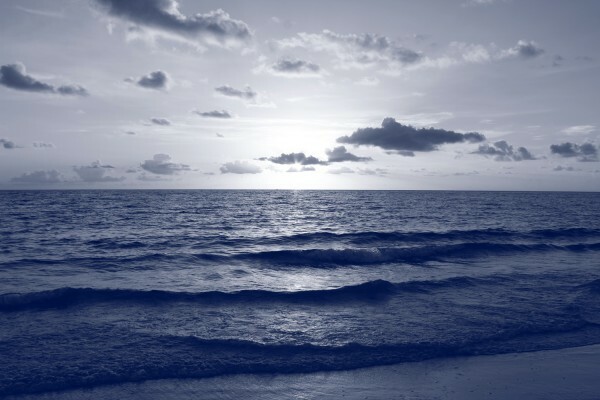 Your on vacation, sit down and just soak in the natural beauty. 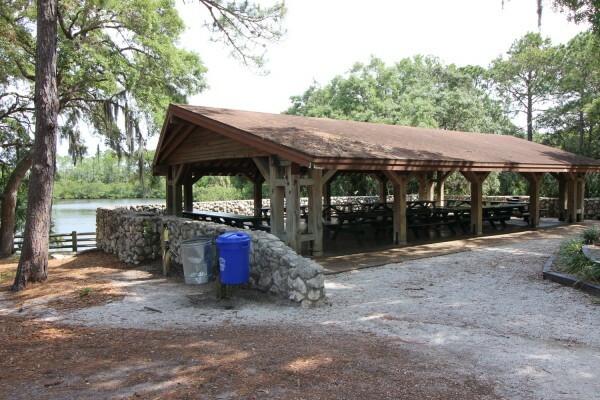 There are no less than six fishing piers located throughout the park. 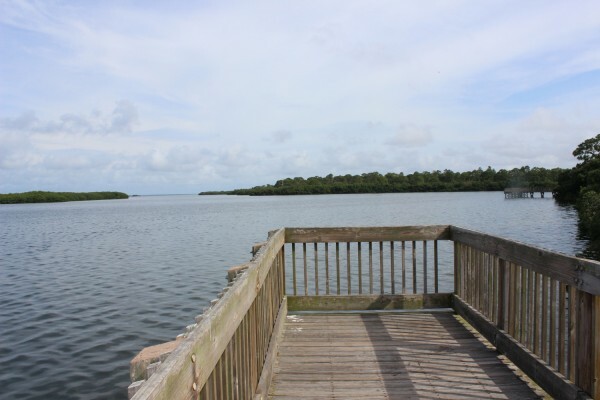 This pier is facing West and is a great spot for watching sunsets, catching a cool breeze or just waiting for that huge snook or redfish to bite. 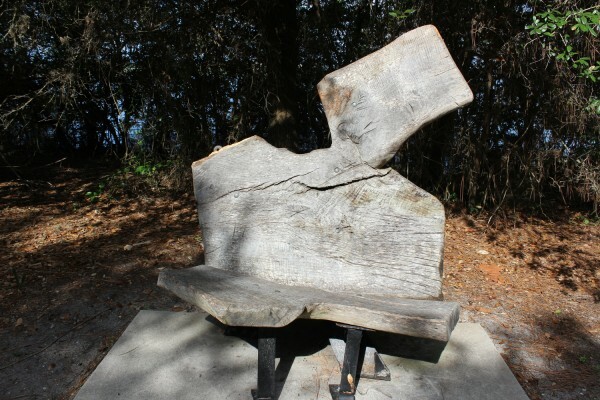 A number of these benches dot the park and are made from large irregular blocks of Florida oak trees. 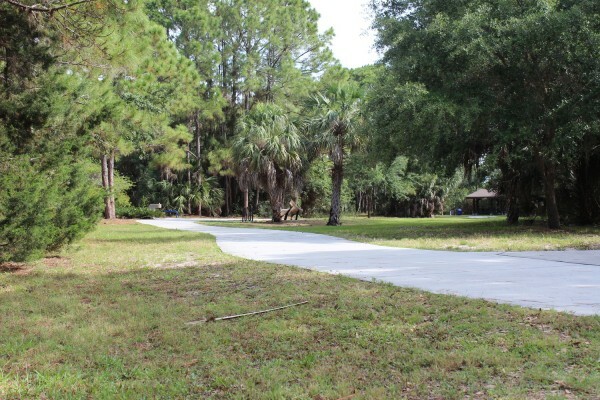 The paved walking trails are popular for walking, roller blading, bicycling and strolling. 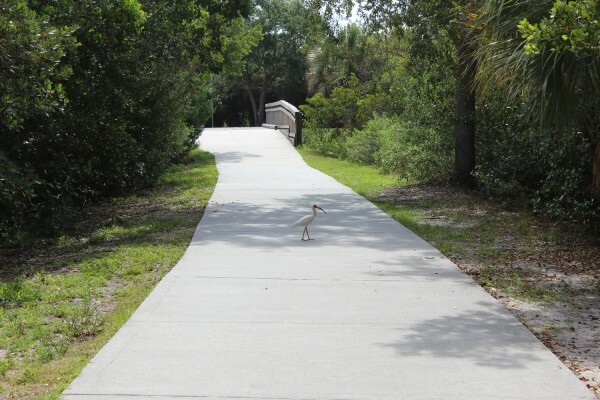 White Ibis can be seen sticking their long beaks into the ground searching for food along the trail. These birds usually travel in flocks, but this one is just walking along with me. 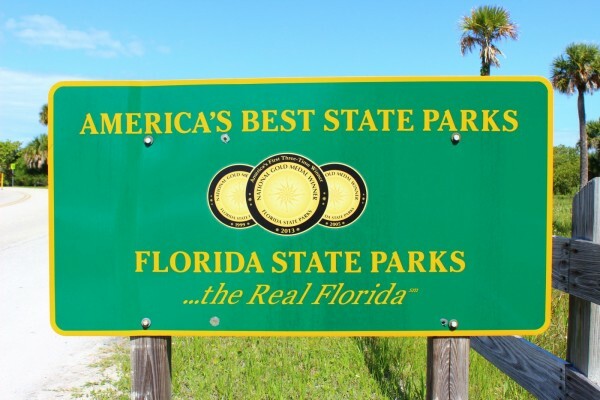 This informative map gives you a guided tour of the park, its trails, and amenities. 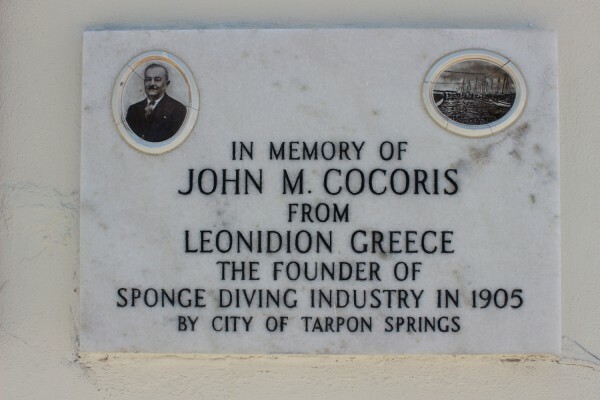 In the early 1900's spongers from Greece began settling this area due to the plentiful supply of sponges off the coast of Florida. 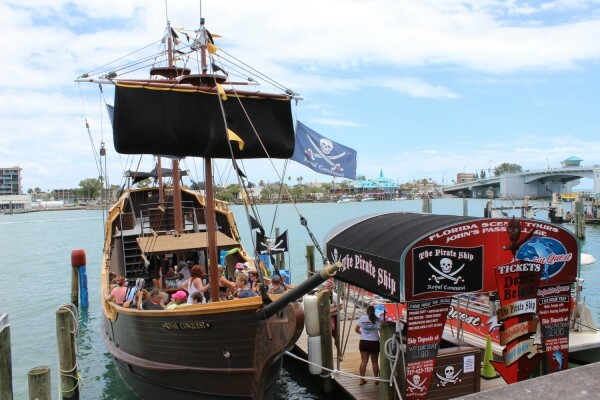 Experience the rich history and amazing Greek food with a day at the sponge docks. 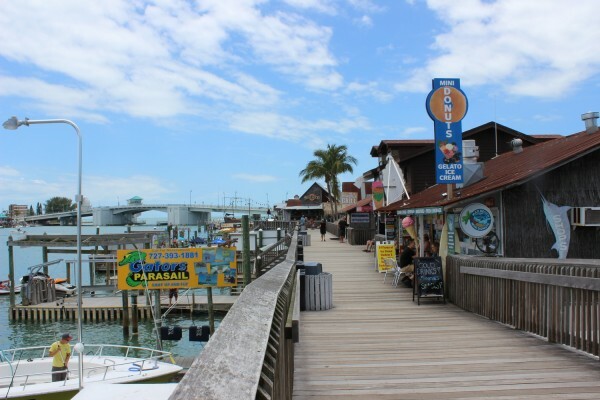 One of our favorite fresh seafood markets and restaurant at the end of the sponge docks. 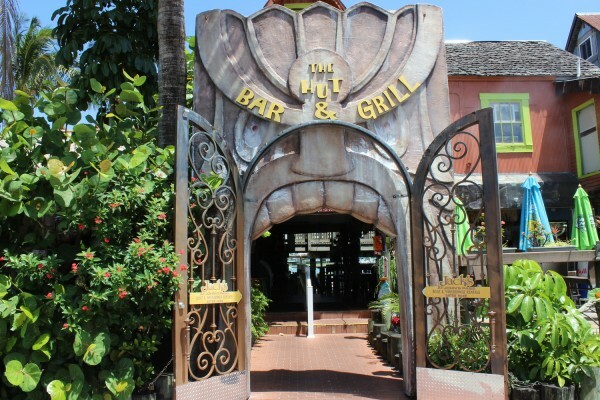 Due to their popularity expect a wait for dinner, but don't mind it is well worth it. Tell them Florida Sun sent you! 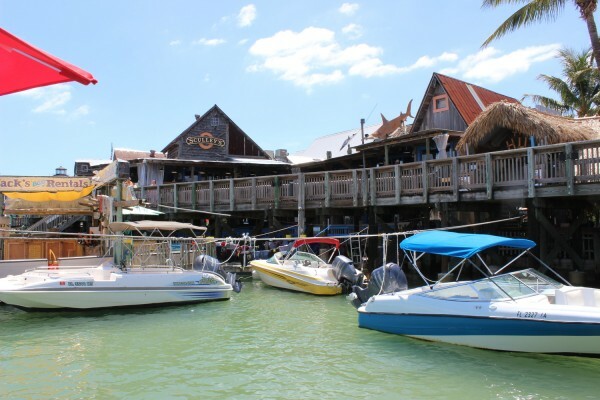 This hidden gem near the end of the sponge docks houses many species of fish from the area. The live interactive feeding is a favorite among the youngsters. 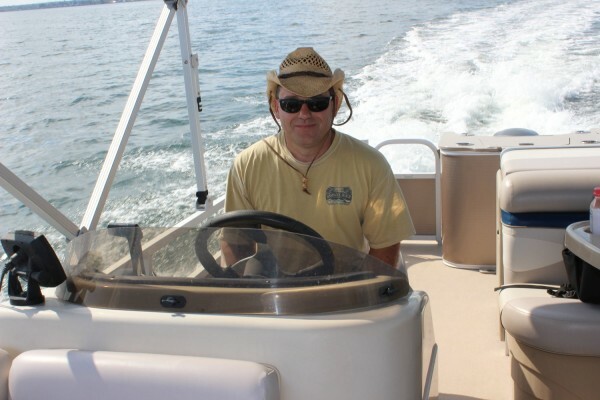 Hop aboard for a day of deep sea fishing. 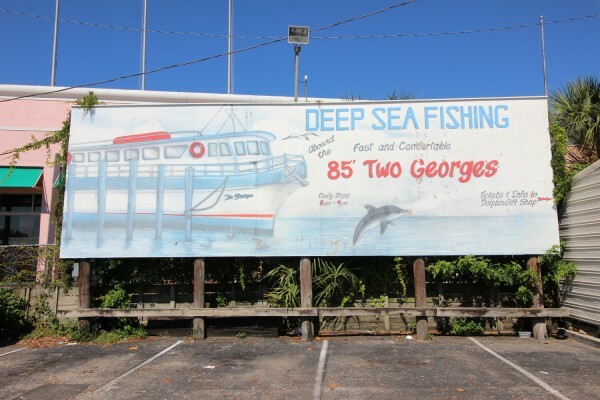 Very affordable and I hear the catches are pretty good. 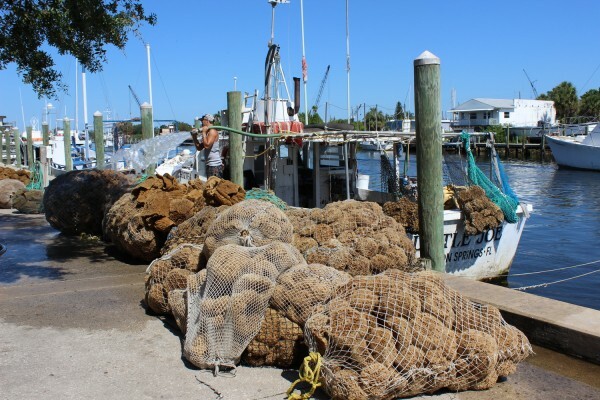 They will filet the catch and local restaurants will even cook it for you. 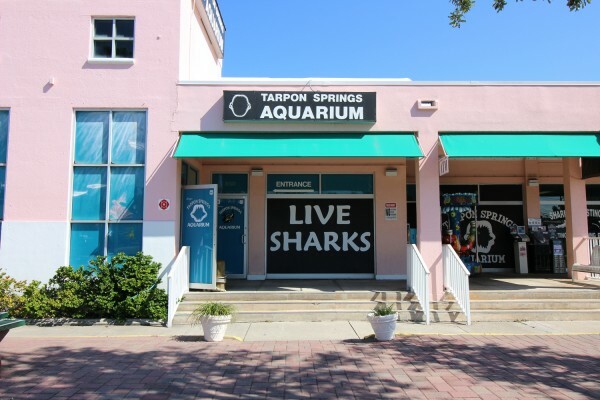 This world famous Tarpon Springs icon has delicous food and pastries to die for. 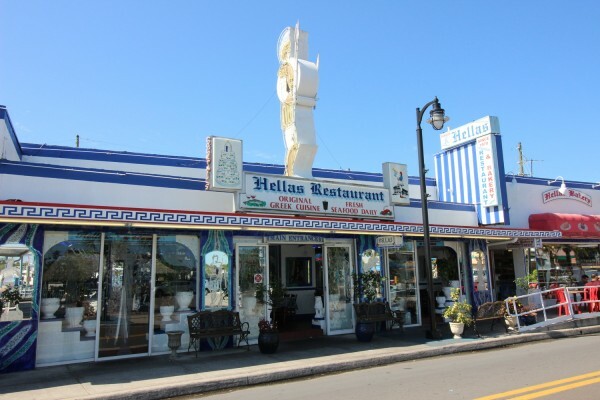 Piles and piles of calories await inside of Hellas Bakery. 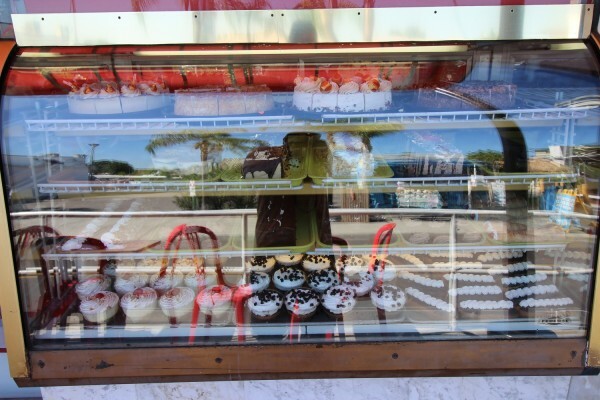 Go ahead splurge a little. 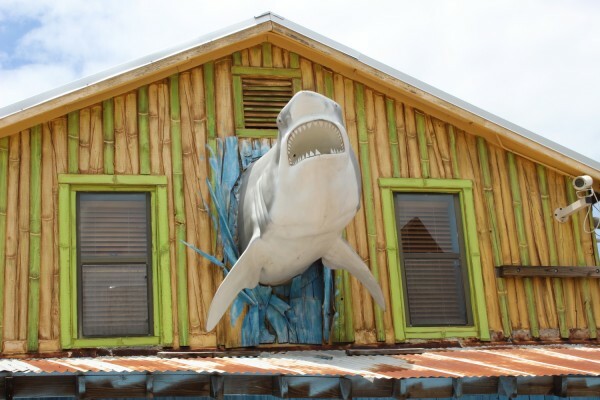 Your on vacation! 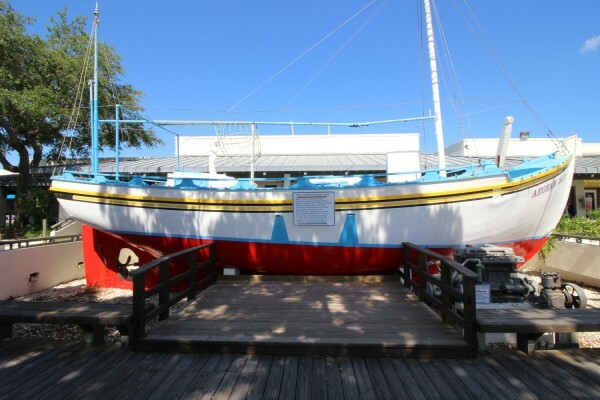 Many boats still line the old Tarpon Springs Sponge Docks and await there next foray out to sea. 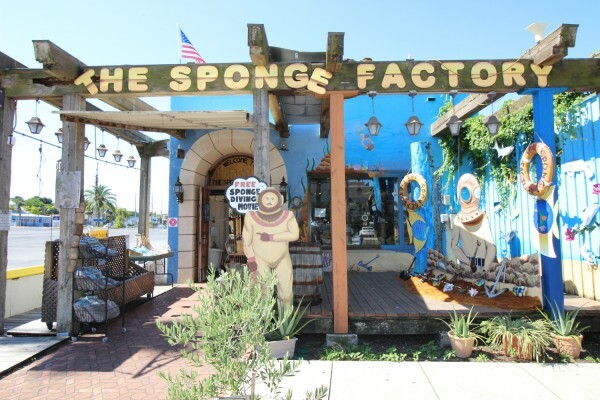 This shop has a great film that runs all day long and explains the rich history of the rise of the sponge trade and the tecniques for harvesting sponges from the deep. 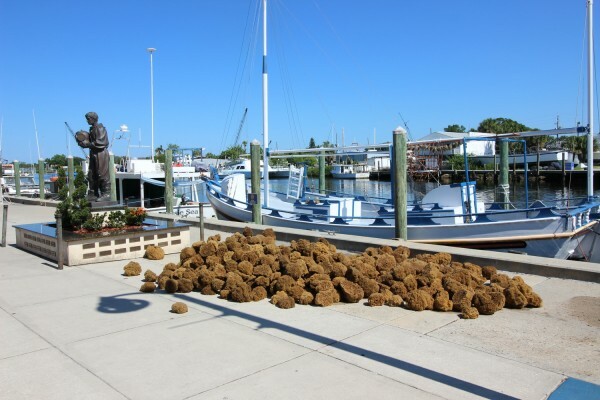 At the entrance to the sponge docks and near the huge parking lot. 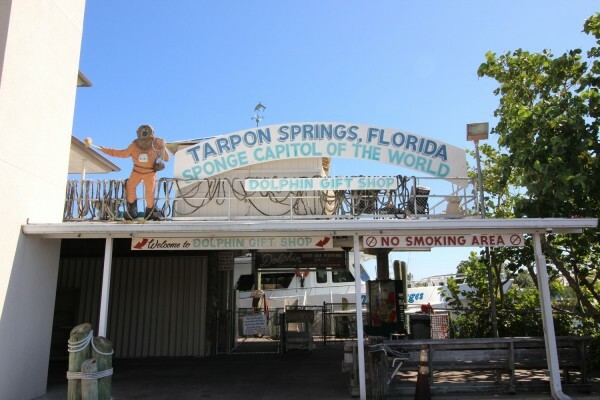 Tarpon Springs welcomes you. 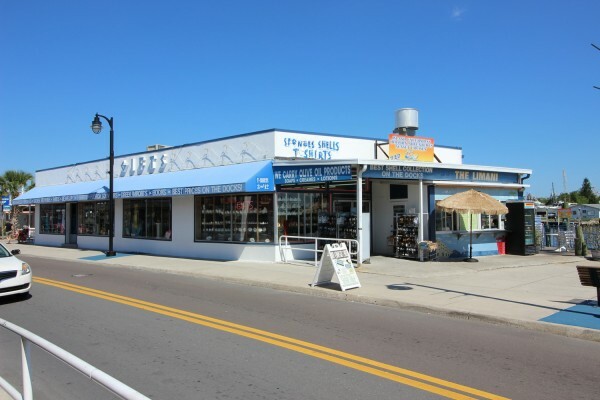 Many shops line the streets where you can buy sponges, goats milk soaps, shells and other nifty gift ideas. 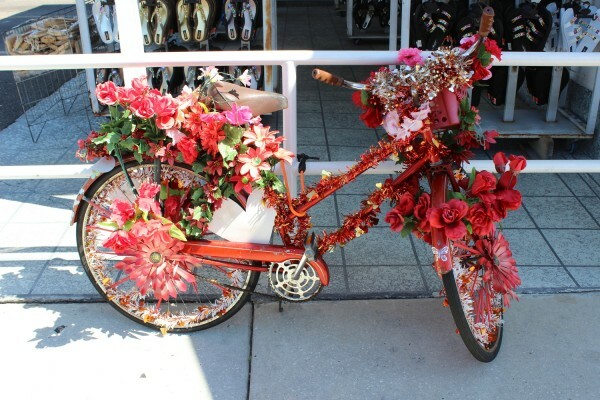 The bikes of the sponge docks are the work of an anonymous artist. See how many you can count on Dodacanese Blvd. The best goats milk soap on earth exists here. 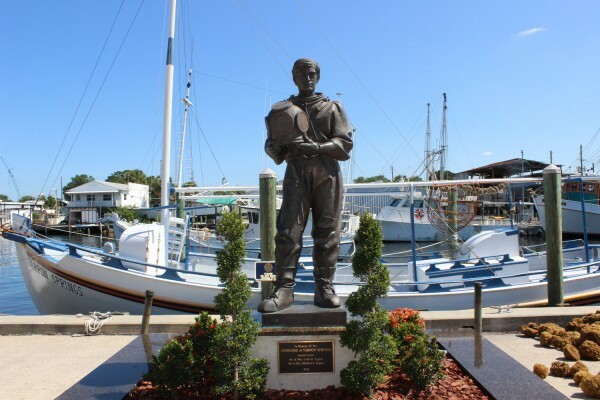 This monument displays the typical suits used by divers for sponging these waters. 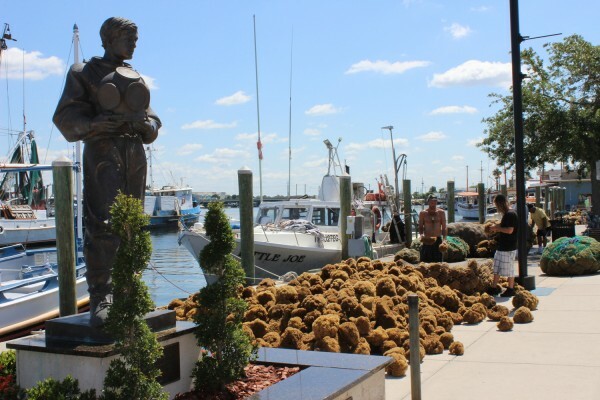 These two men spent more than three weeks at sea harvesting. 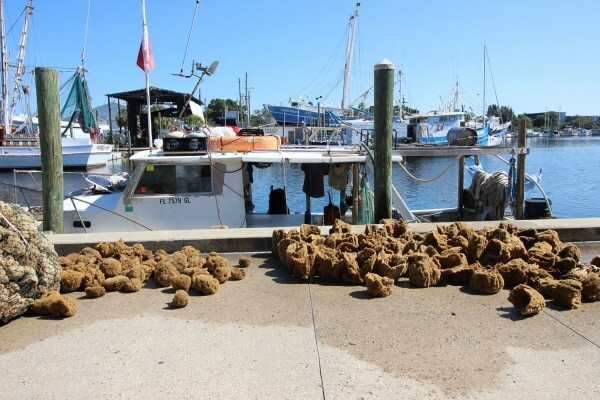 These sponges are awaiting bidders and eventual sale. 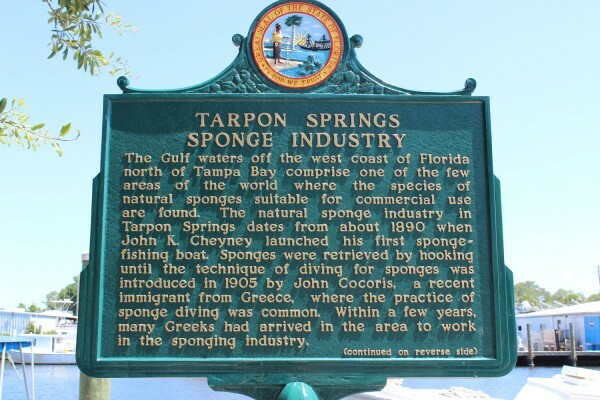 Considered the founder of the sponge industry in Tarpon Springs. 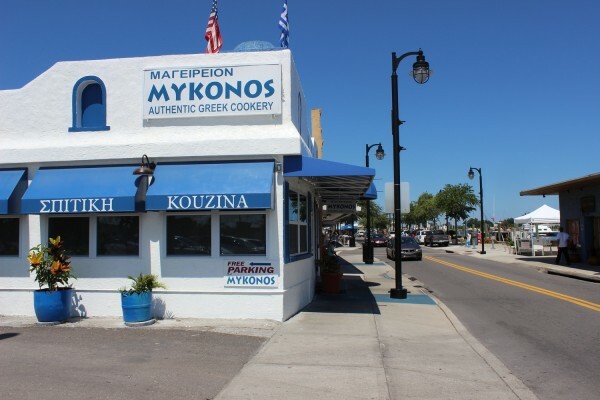 Authentic Greek restaurants, too many to count, await you, including Mykonos. 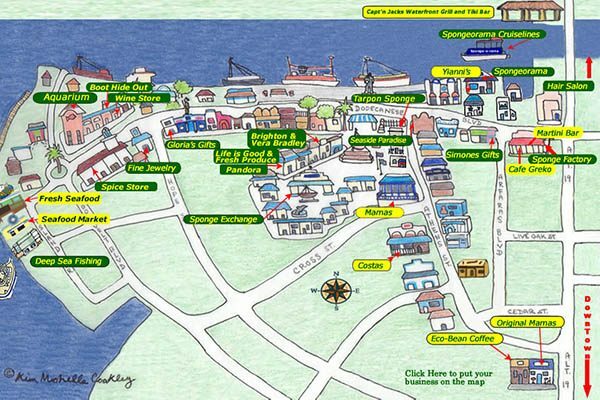 Interactive map of many of the sights. 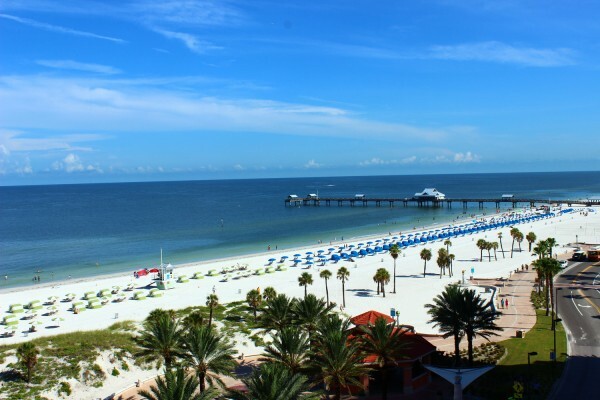 World Famous Clearwater Beach voted Best Beach in America in 2016 by Trip Advisor. 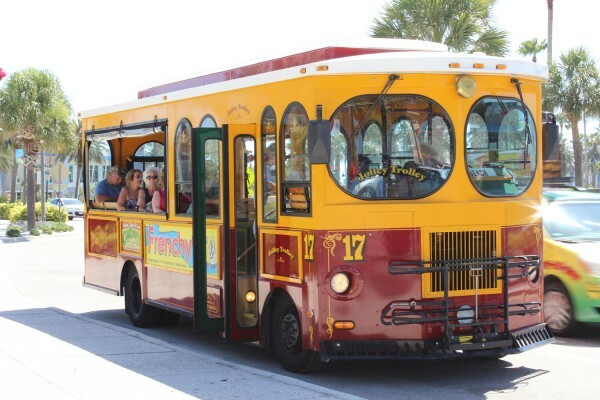 All our properties are close to the Jolley Trolley Line, our version of a bus, that runs from Tarpon Springs to Clearwater Beach and beyond down the beaches. 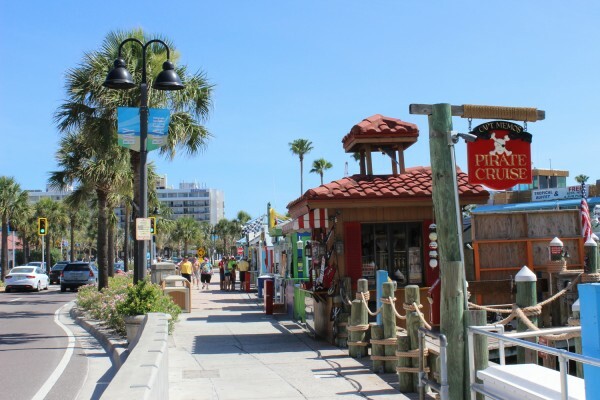 A great way to see all the beaches and avoid parking headaches. For a fee they set these cabanas up for you. 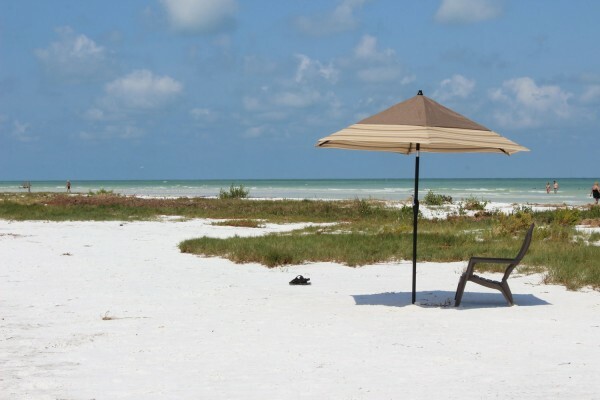 You can rent beach umbrellas to avoid the heat. 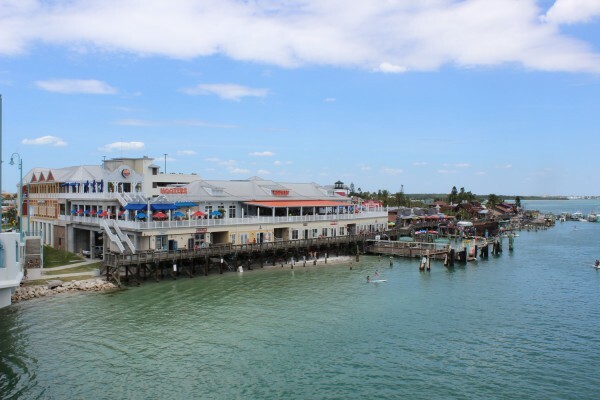 This is from the pier looking North towards Honeymoon Island in the distance. 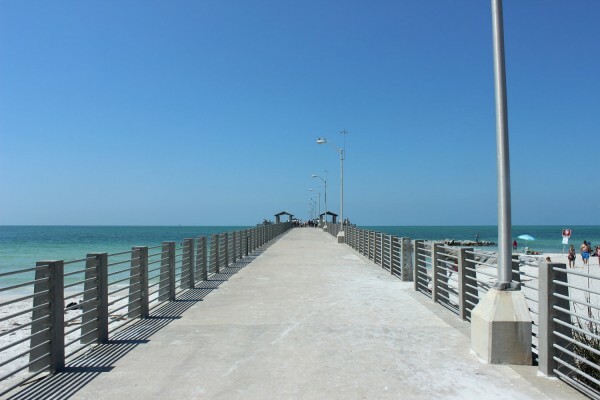 This view is from The Pier looking South towards Sand Key in the distance. 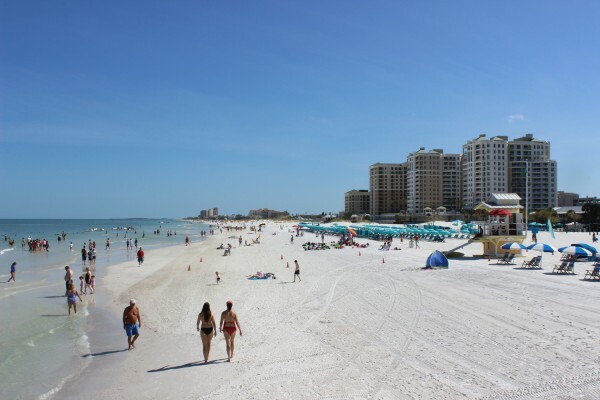 Little Known and better than the main portion of Clearwater Beach in my opinion is the area North of Clearwater Beach. Less crowded and serene. This section is where the locals know and go. 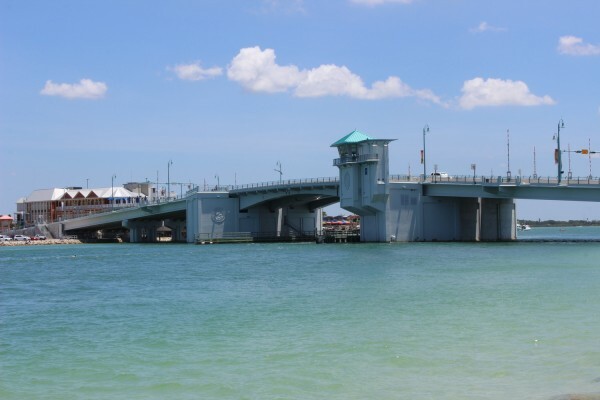 Get a load of the Blue Water in the area North of Clearwater Beach. 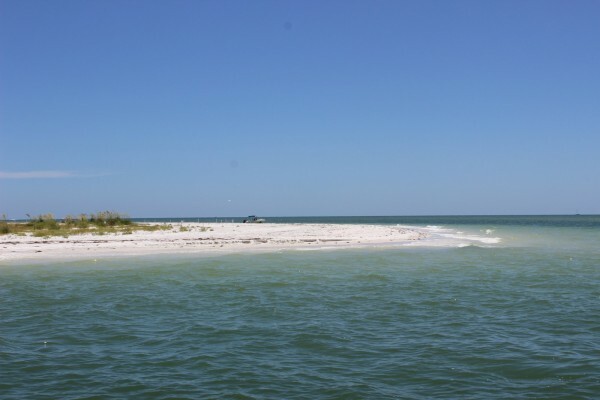 This section extends from Clearwater Beach to Caladesi Island. 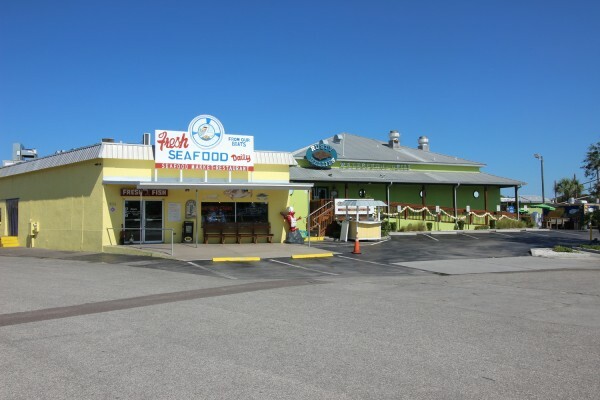 This spot is near Frenchy's Resturaunt a local favorite. At the entrance to Pier 60 is a fantastic playground. Also the scene of street performers and other events. 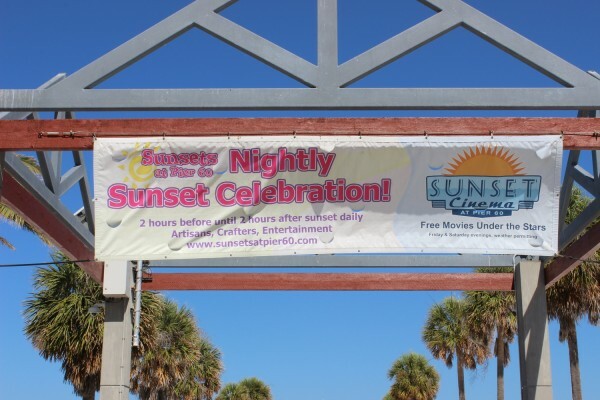 Be sure to catch Movies at Sunset a local tradition and popular attraction. Taken in June when the crowds die down a little from there peak in March and April. 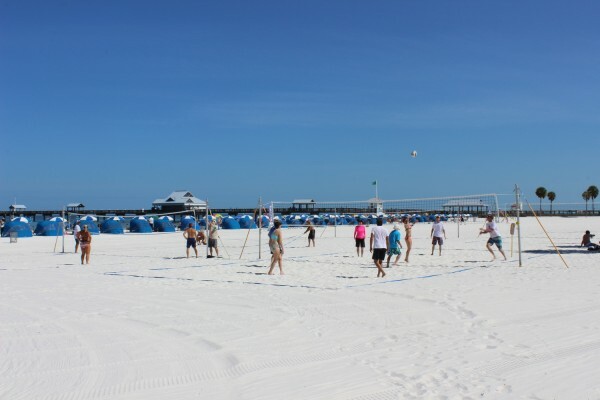 These volleyball courts are almost always in use and open to the public. 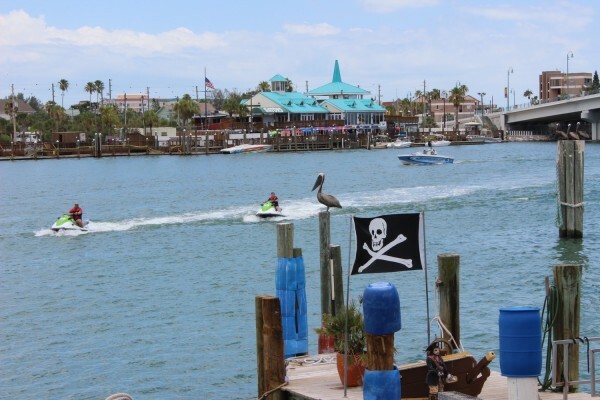 There is something for everyone here including a Pirate Cruise, Fishing, Thriller Boat Ride, Dolphin Cruises, Parasailing and More. 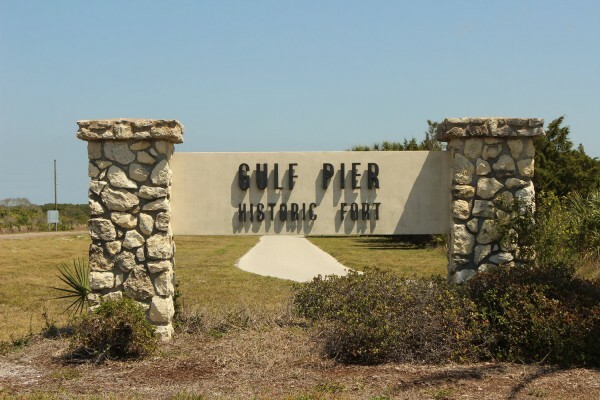 Beginning in 2016 is the new entrance and park. The water slides are open all day and are a refreshing way to cool off. 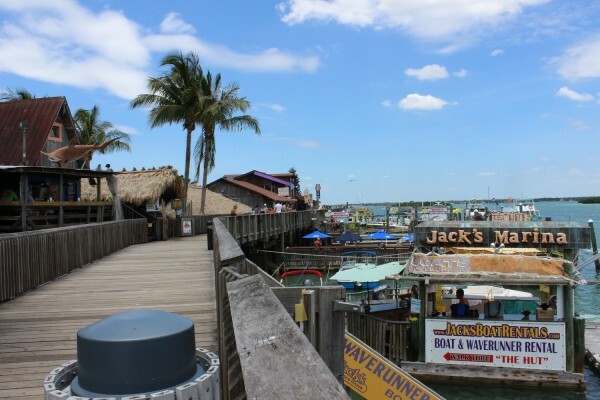 Plenty of places to spend money here and have a good time. 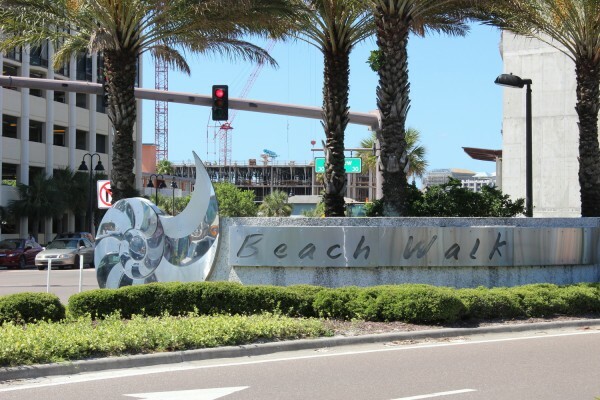 New is the completion of the Beach Walk area, a revambed area of shops and resturants. 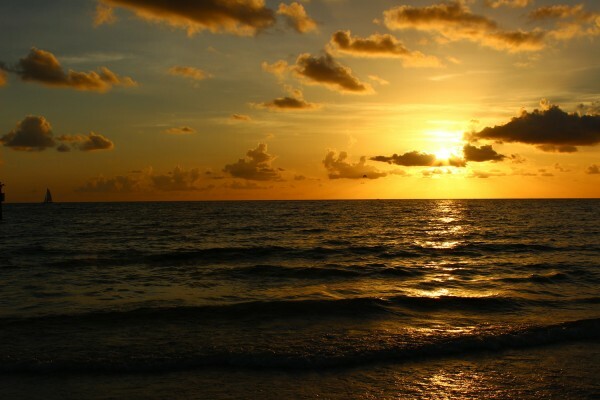 One thing that is Guaranteed in life are the Nightly Sunsets. 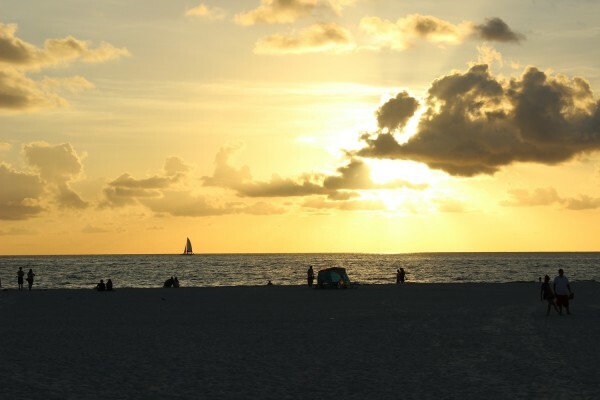 Clearwater Beach is the setting for beautiful sunsets from the white sand. 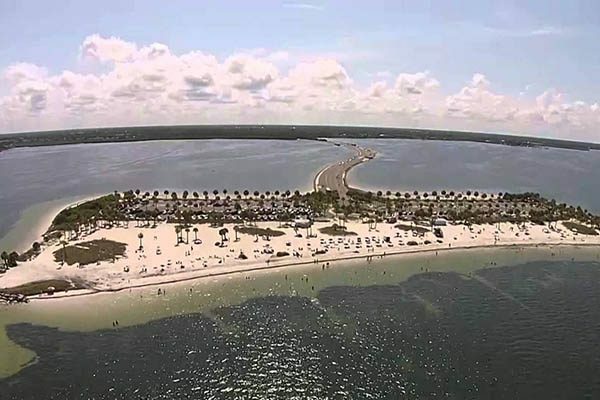 There is even a beach at Johns Pass. 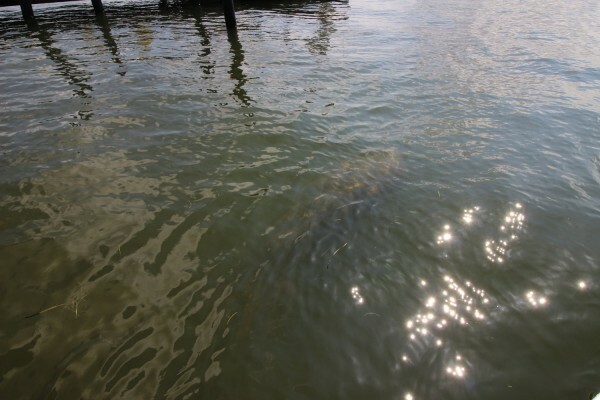 This is a younger Manatee that swam by on the way to find food. 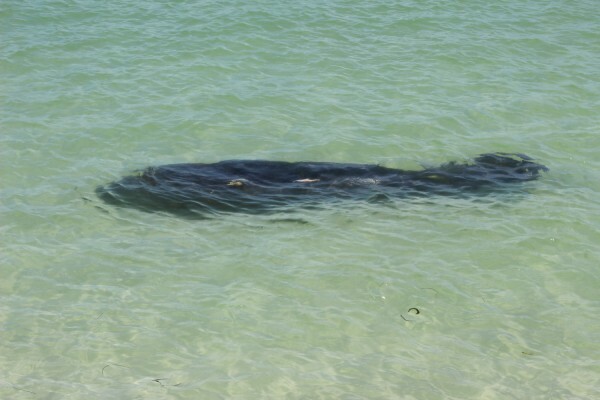 Also known as a Sea Cow. 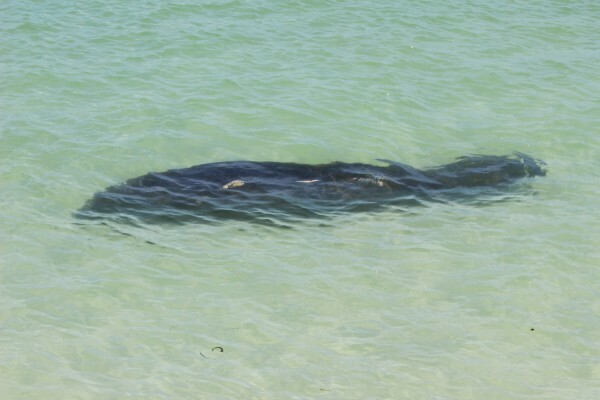 These animals move slowly but can actually swim up to 30 Miles an hour if need be. 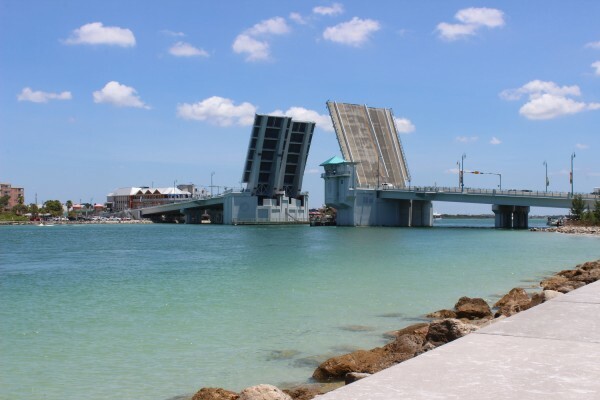 The bridge opens for larger craft, in this case the deep sea fishing charter. A great place to spend the afternoon. 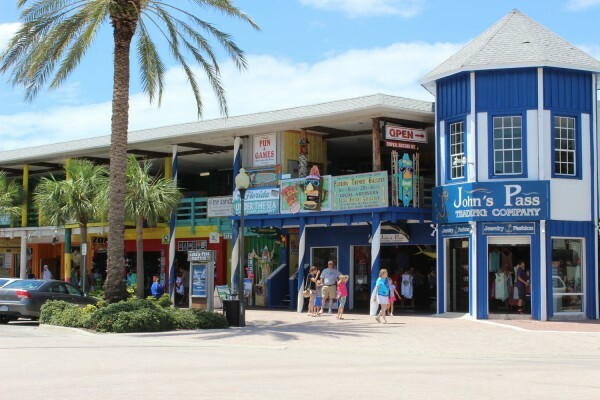 There is numerous gift shops and outstanding resturants. 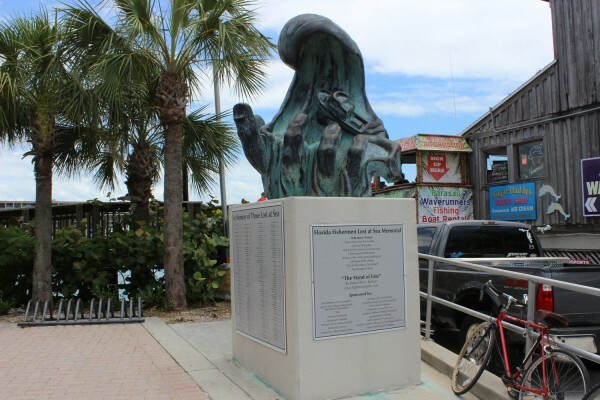 A very cool memorial that honors the many lives lost at sea. 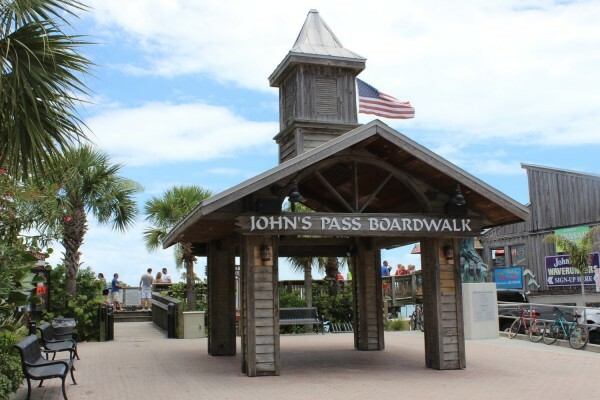 Johns Pass has been a fishing village since the beginning of time, and unfortunately some did not return. 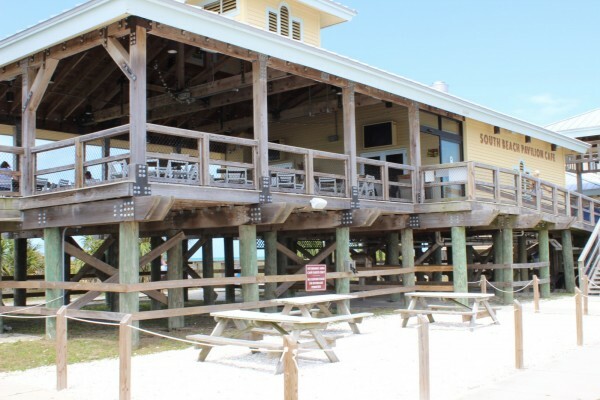 The Hut Restaurant on the water where you can eat right next to Johns Pass. View from the bridge. 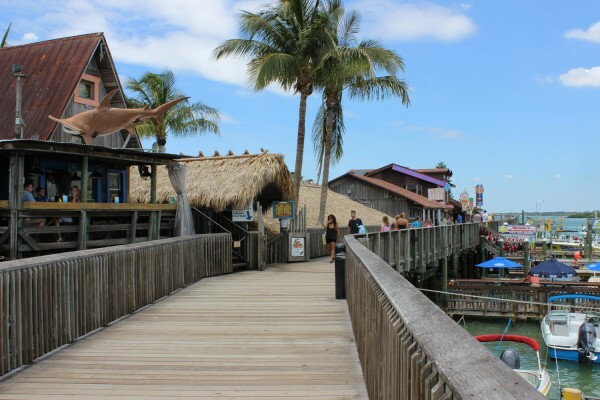 There's a Hooters, and Bubba Gump's along with other great resturaunts that are local favorites. 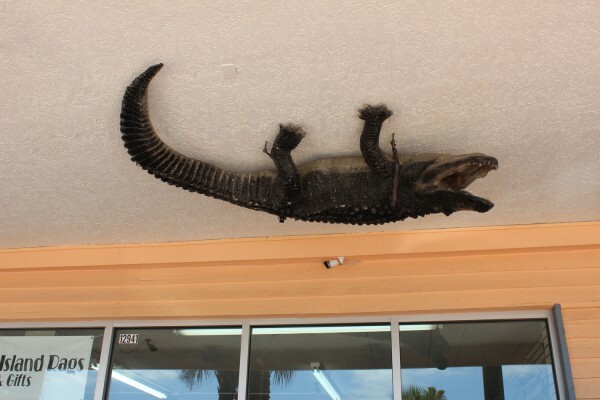 One of the few places in Florida where Alligators actually walk on the ceilings. 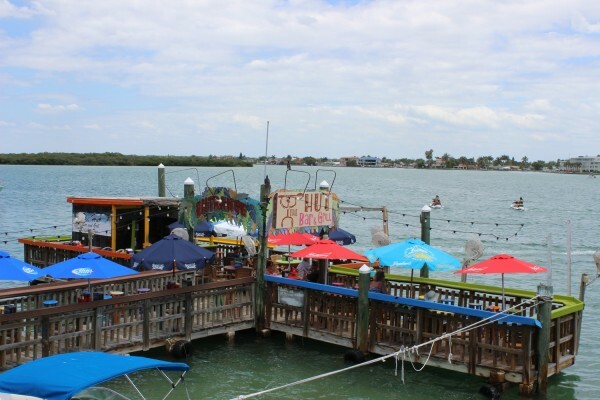 One of the best spots in all of Pinellas County. 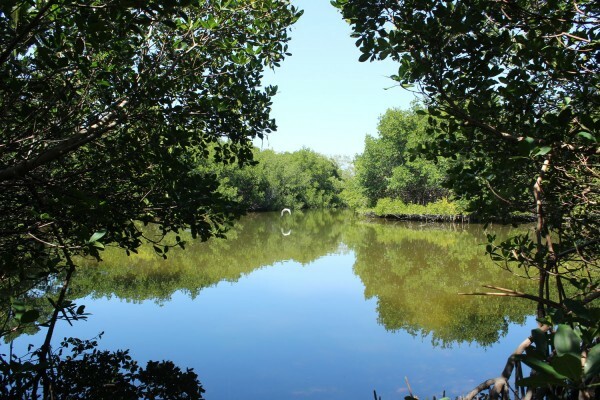 Spend your day kayaking, fishing, swimming and boating at this fabulous park. 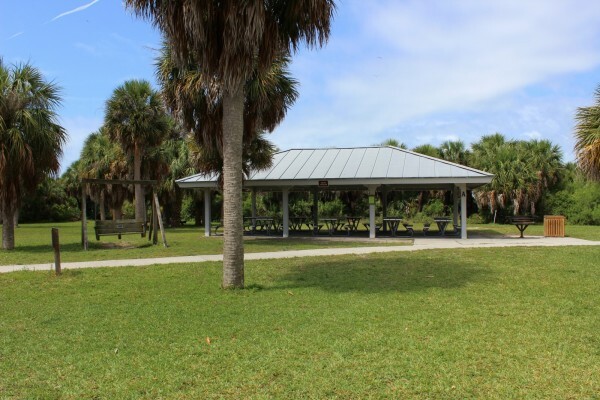 As in all Pinellas County parks there is ample covered structure for holding that special event. 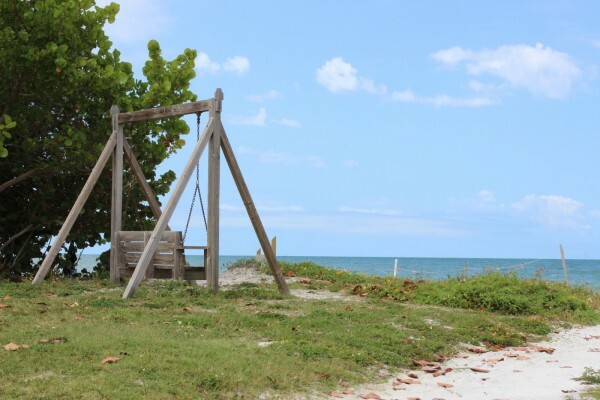 Always need a playground for those little ones to unwind at. 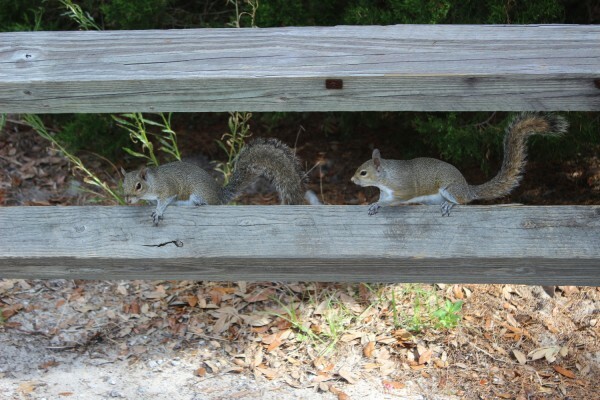 You will find a couple throughout the park. 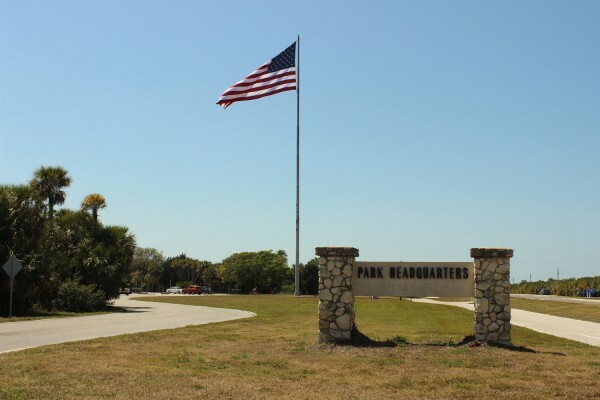 This flag can be seen flying at the Park Headquarters. 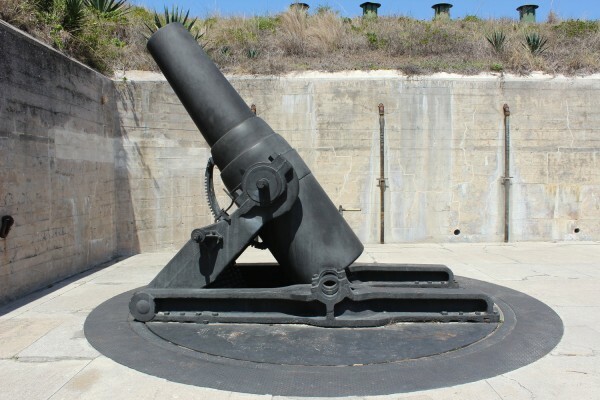 Used to store ammunition and other supplies. 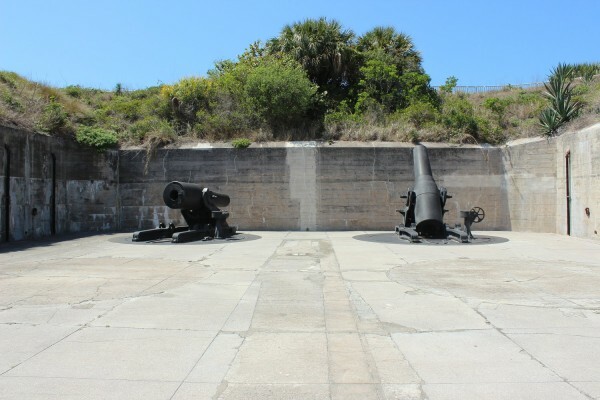 These posts were to contain batteries of artillery and mortars to protect Tampa Bay from any invading forces. 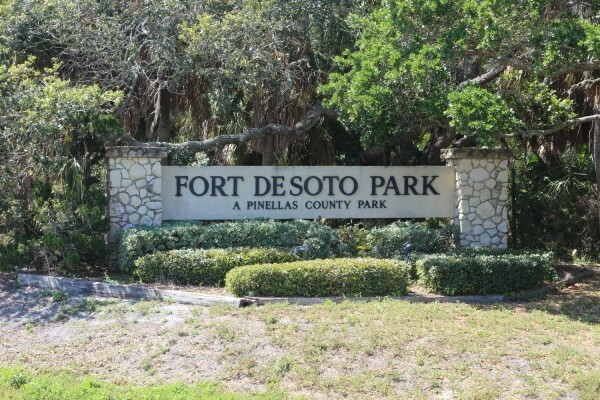 Construction of Fort De Soto began in November 1898 and was completed in 1906. 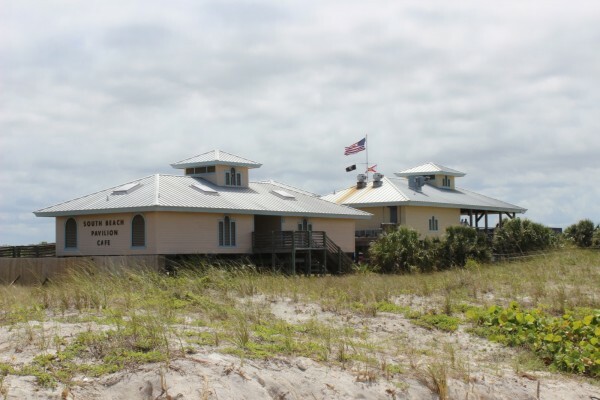 The foundation was constructed of a shell concrete formula and the walls and ceiling used a shell, stone and concrete mix. 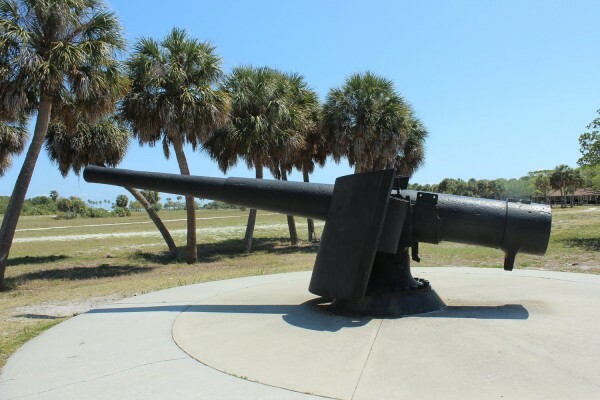 The main attractions at the completed post were the artillery and 12-inch coast defense mortar batteries, Batteries Laidley and Bigelow. The post consisted of 29 buildings. 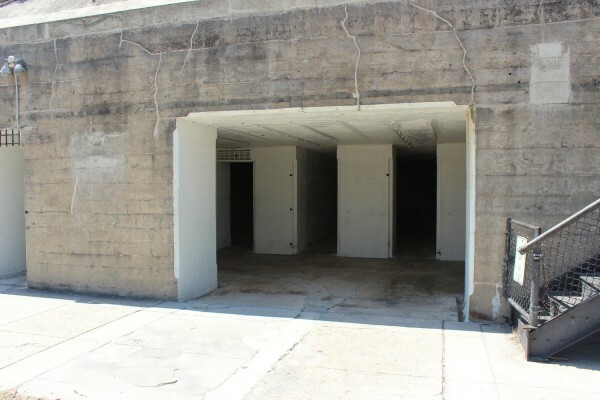 The post's features included a large barracks, a hospital, a guardhouse, a blacksmith and carpenter shop, an administration building, and mess hall with kitchen, a bakery, and a storehouse. The site also had brick roads, concrete sidewalks and a narrow-gauge railroad to aid in moving materials and supplies around the post. 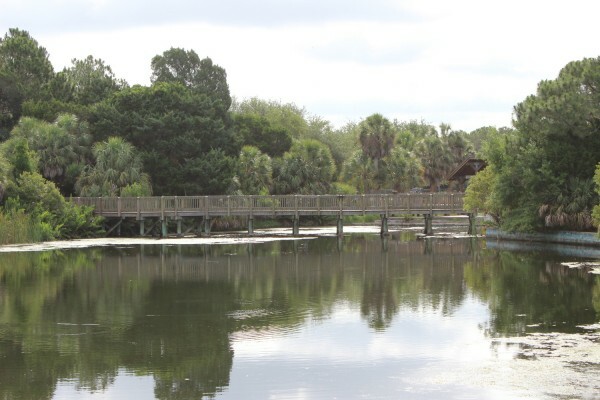 There are a two piers for fishing and sightseeing located at the park. 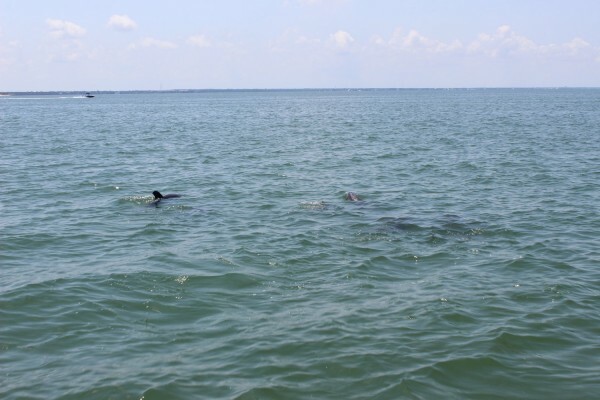 Common are dolphins swimming by while feeding. 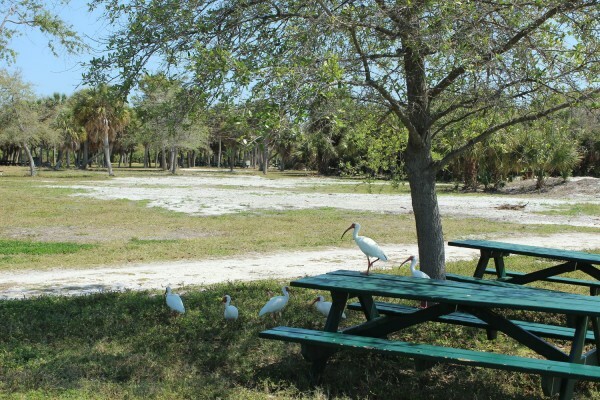 Wildlife abound with numerous species of birds that call this park home. 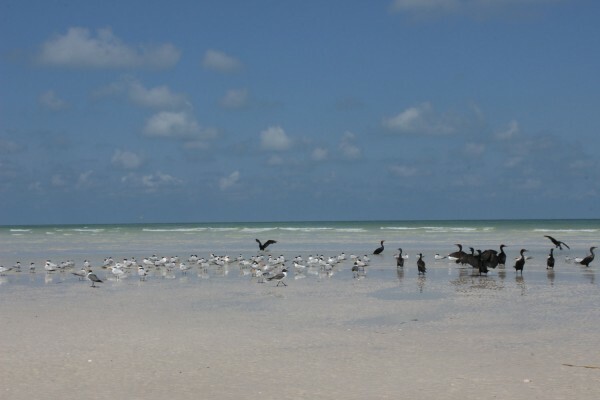 These cool birds use there long and strong beaks to get food in the sandy soil. 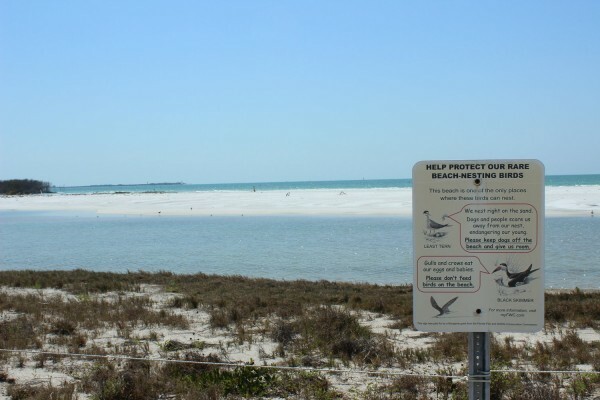 There are a few beaches that are protected nesting areas vital to the ecosystem. 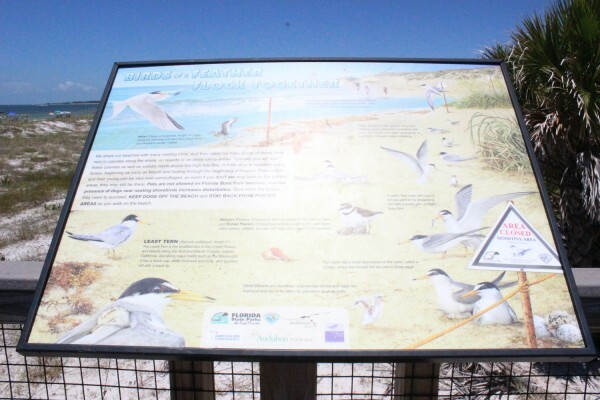 Protected nesting grounds off limits to sunbathers. 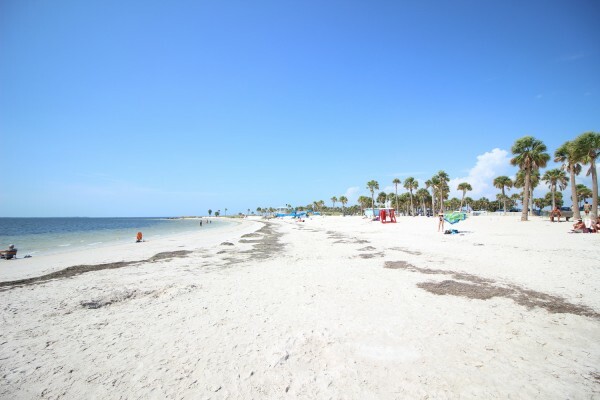 Miles of pristine beach await you. 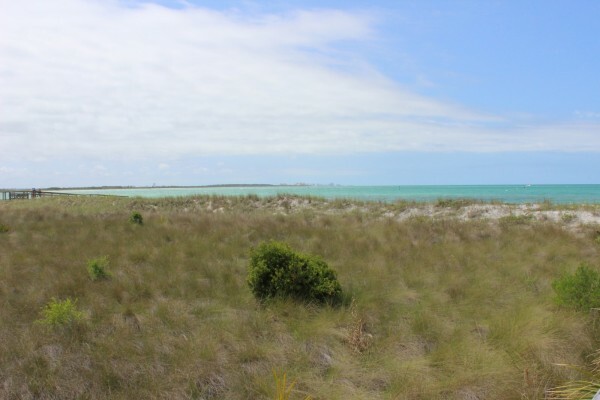 This is one of the best sections of beach anywhere in the world and a popular spot for locals. 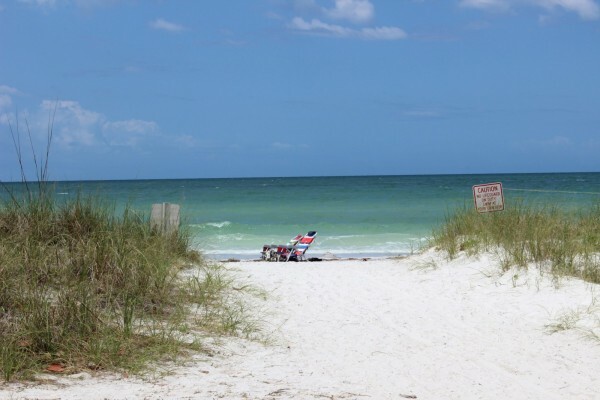 You can park your car very near to the beach and walk a short distance to the beach. 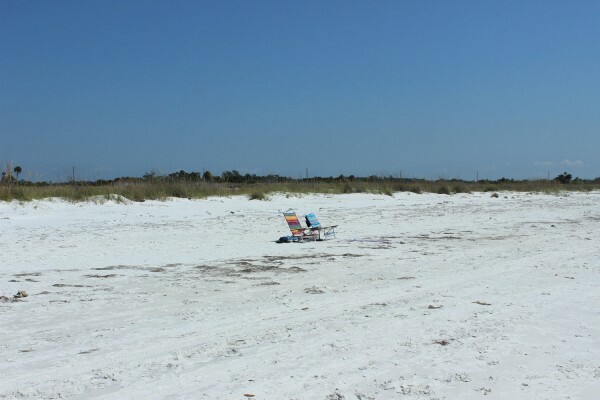 Grab your spot and set a couple chairs in the sand for a day of relaxing. 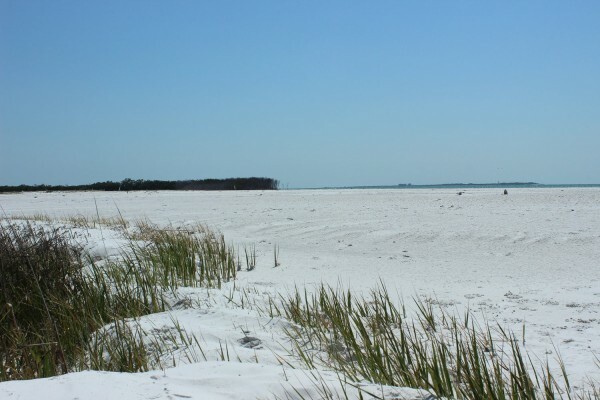 The shifting sands and sea oat banks offer protection for the islands. 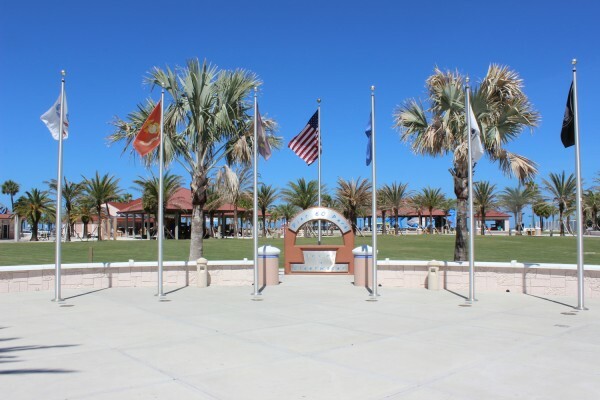 Check out this wonderful park and the many beaches and opportunities for relaxation and fun. Truly a special place to spend the day. 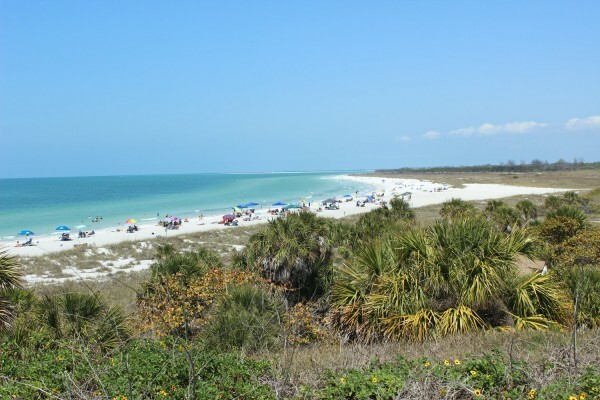 The areas around Fort De Soto Park are some of the best kayaking waters in all of Florida. 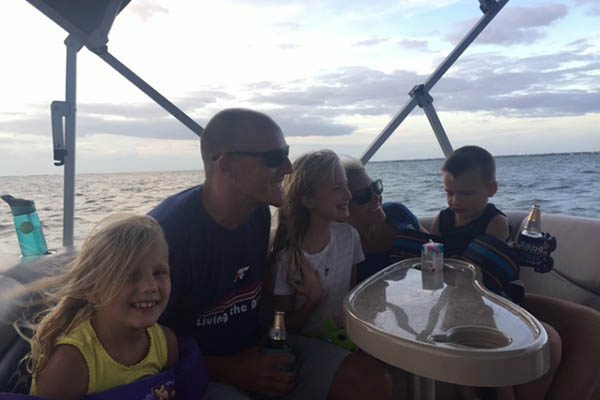 We spend a great deal of time boating the waters around Pinellas County. 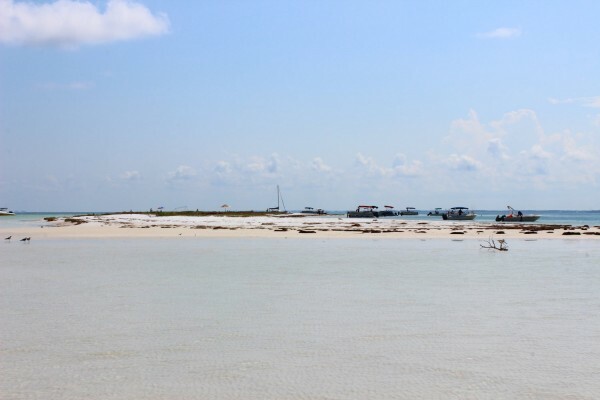 There are so many islands and sand bars where you can enjoy time with the family. The following collection of pictures were taken one day out exploring. 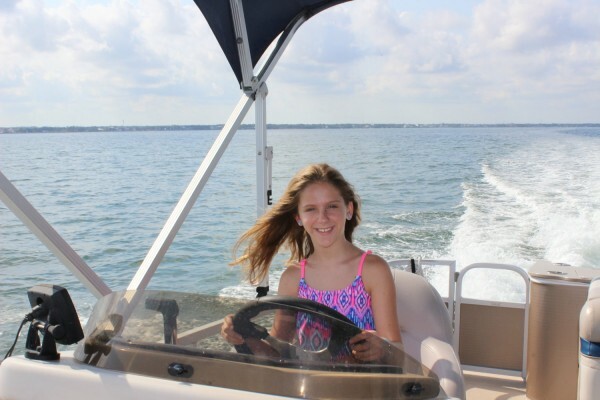 This up and coming boat driver was the perfect date for our Anclote Key and surrounding area exploration trip. 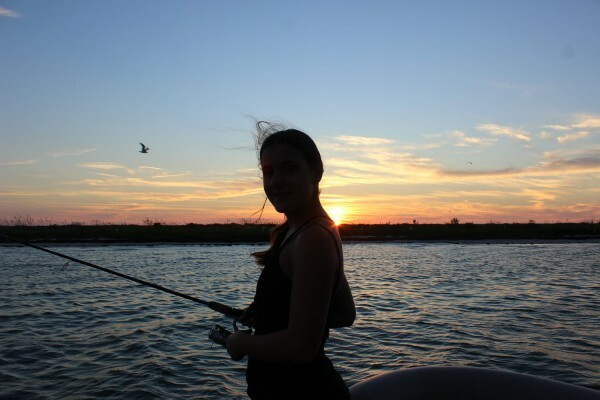 Catch the sunset while fishing for Pompano, Redfish, Snook and Trout. 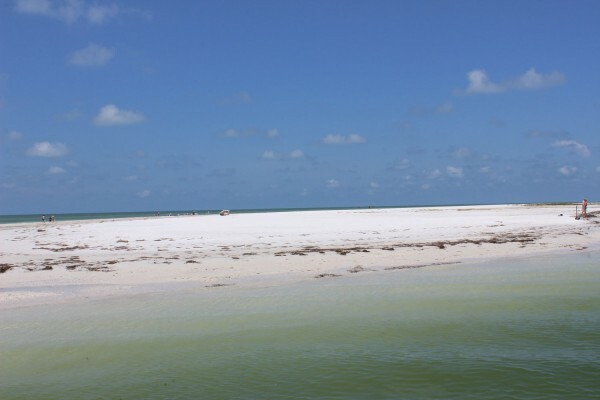 Enjoy the blue-green Gulf waters that lap gently along the sandy beaches of the four islands that make up Anclote Key Preserve State Park - Anclote Key, North Anclote Bar, South Anclote Bar and Three Rooker Island. 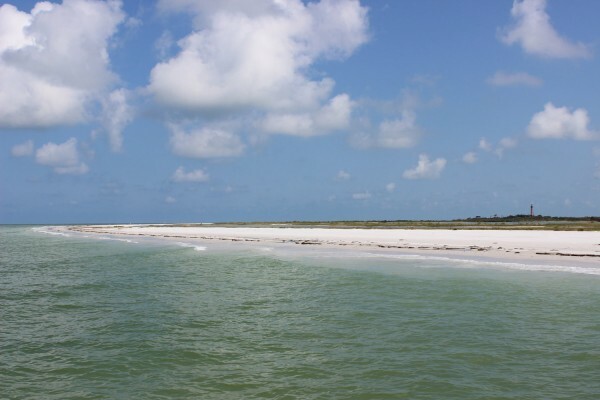 Located three miles off the coast of Tarpon Springs, Anclote Key Preserve State Park is accessible only by private boat or ferry service. 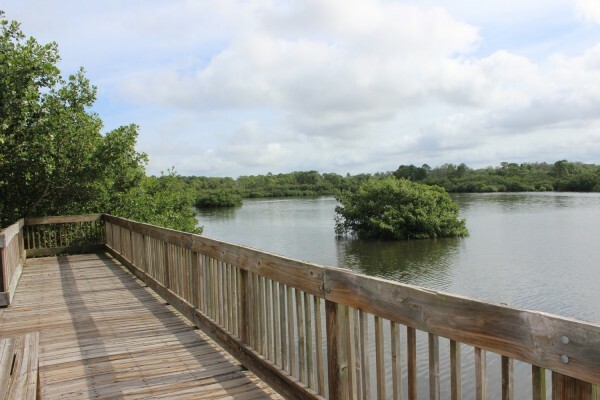 The 403-acre park is home to at least 43 species of birds, including the American oyster catcher, bald eagle and piping plover. 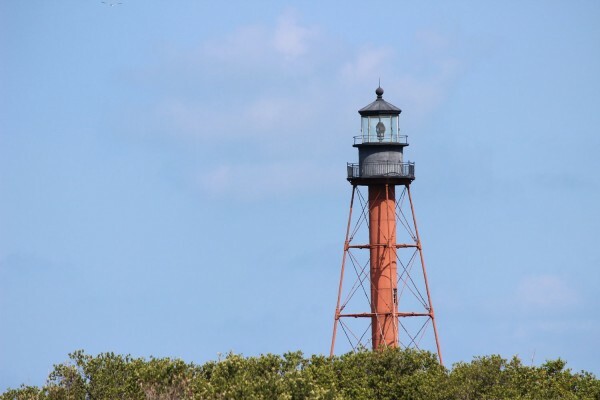 A picturesque 1887 lighthouse stands as a sentinel on the southern end of the island. 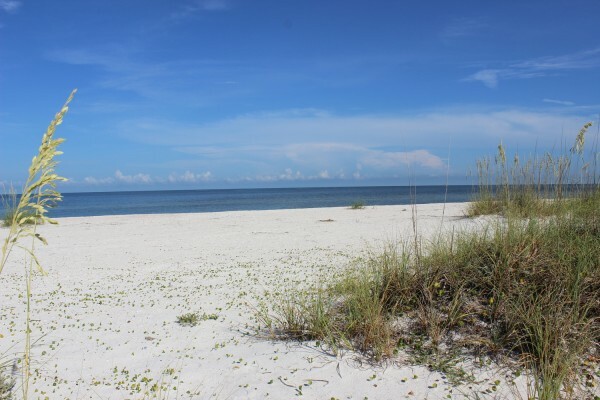 Visitors can swim and sunbathe at the beach, fire up a grill and enjoy a picnic, or pitch a tent and enjoy a night of primitive camping under the stars.